Probably the newest, the most beautiful, and the best equipped Snowgoose available. 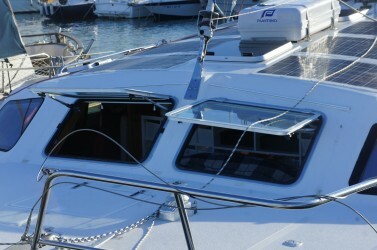 “The Prout 37 Elite is basically the same as the renowned Snowgoose 37, but with a beam that is wider by 1 foot. 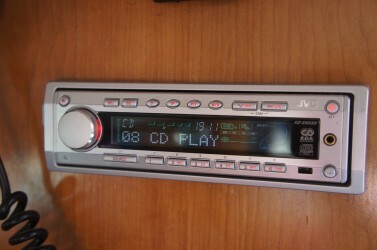 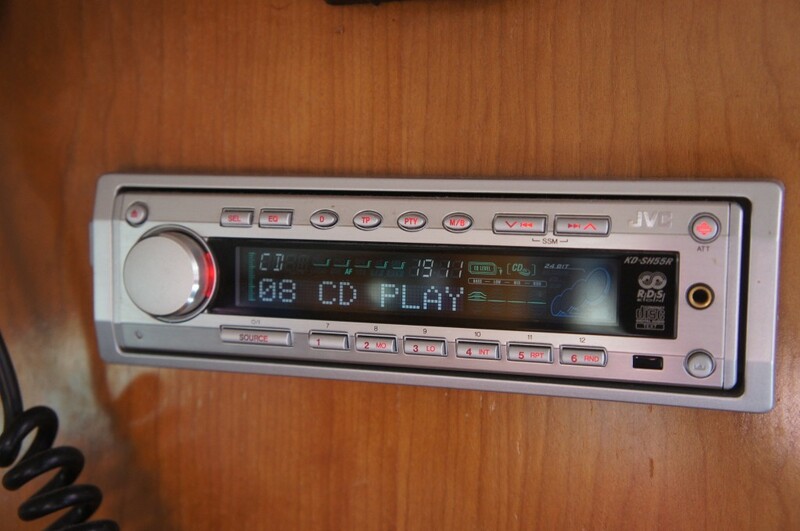 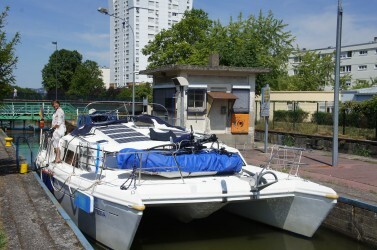 It was built/ finished in 2001. 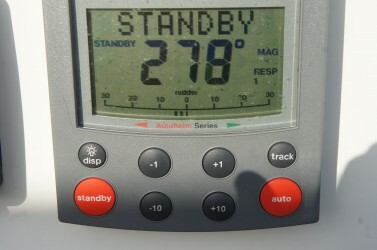 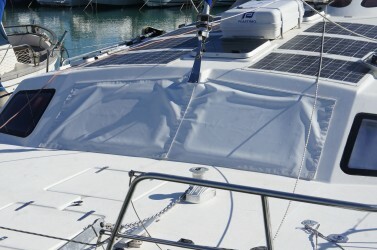 This boat is not by any means a lightweight; the displacement is 5.500kg and heavier than many monohulls of similar length. 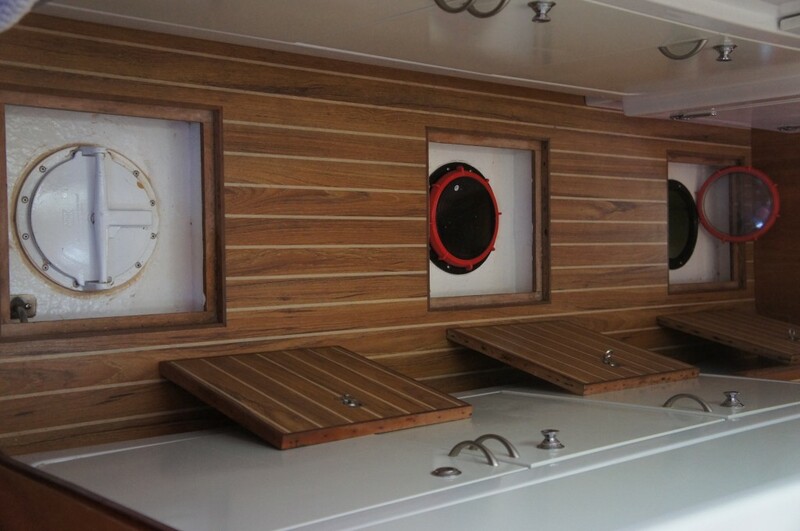 The hulls are solid GRP below the waterline and cored from the waterline up. 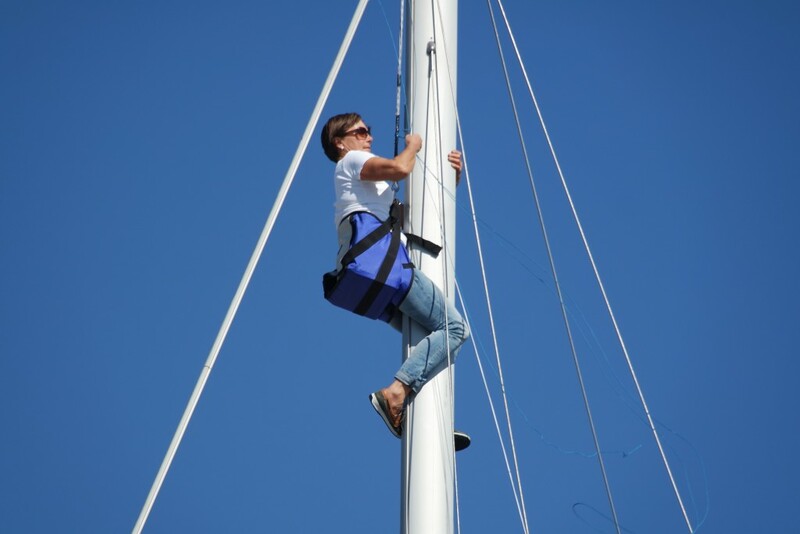 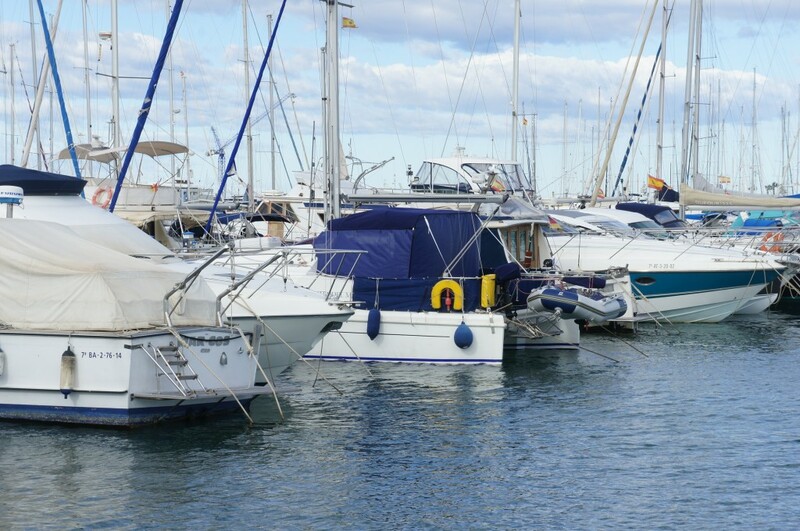 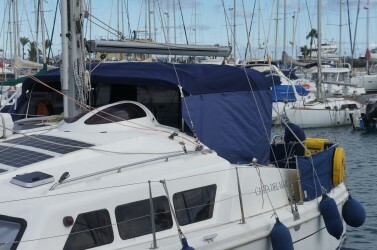 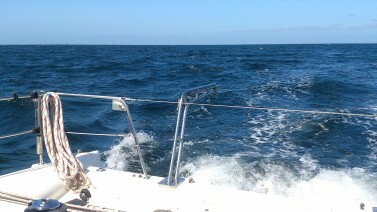 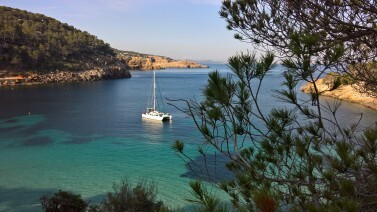 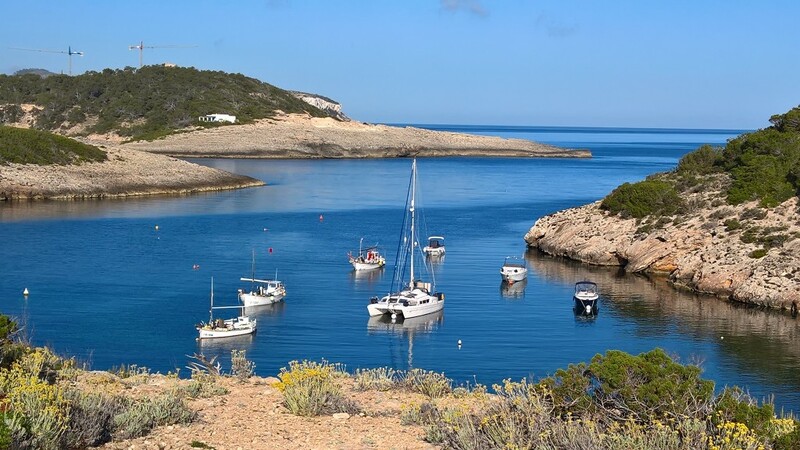 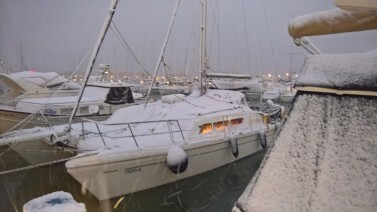 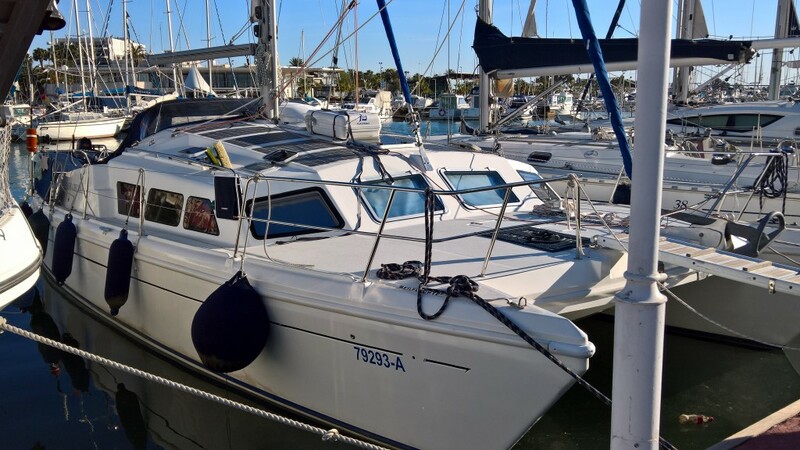 The first Owner of Casita del Mar (in former times “Tara”) did not sail her very much, but he installed an “in mast roller furling” and a bow thruster; 2 things which make sailing and maneuvering much easier. In these first years Tara spent more time in the drydock than in the water. 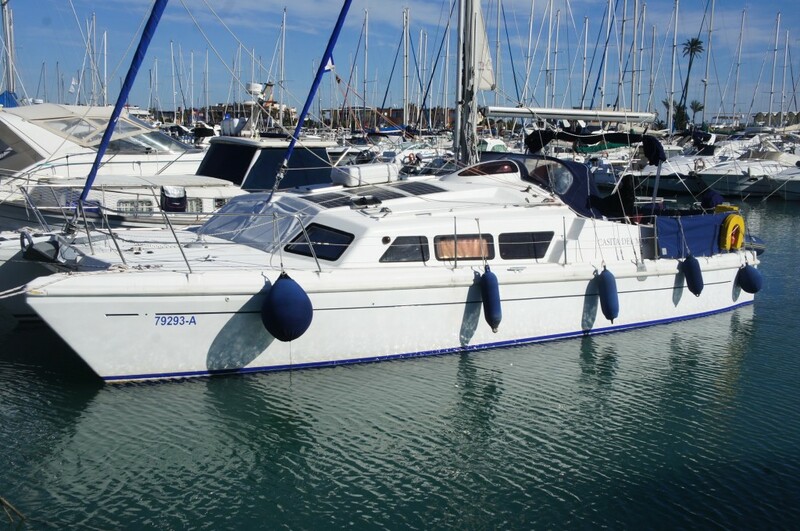 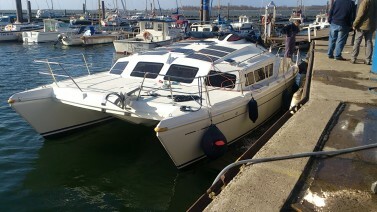 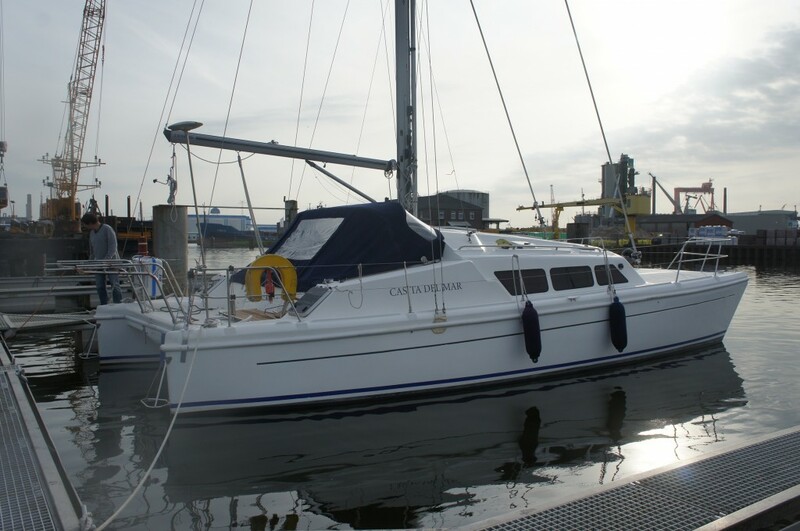 When she was sold in 2013 to a german sailor the engine had only run some 300h and sailed a max. of 1.000nm. 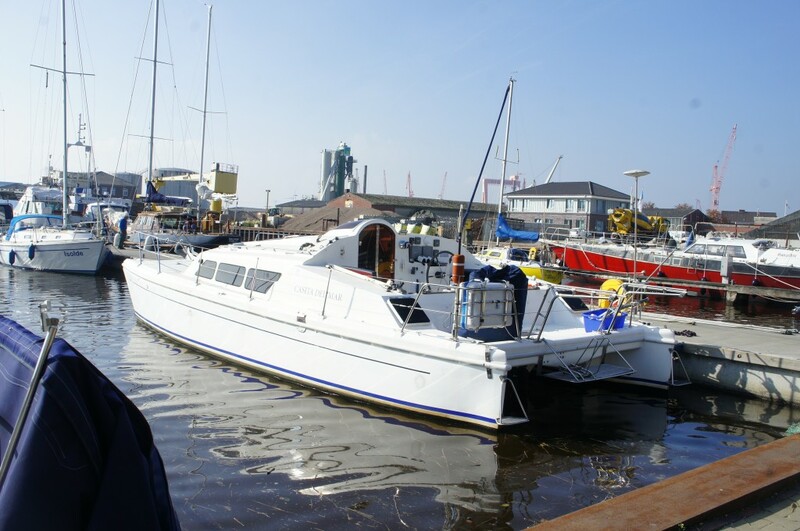 This sailor gave her the new name and brought her to Germany at the end of 2013 but then he changed his plans and we were able to buy her. 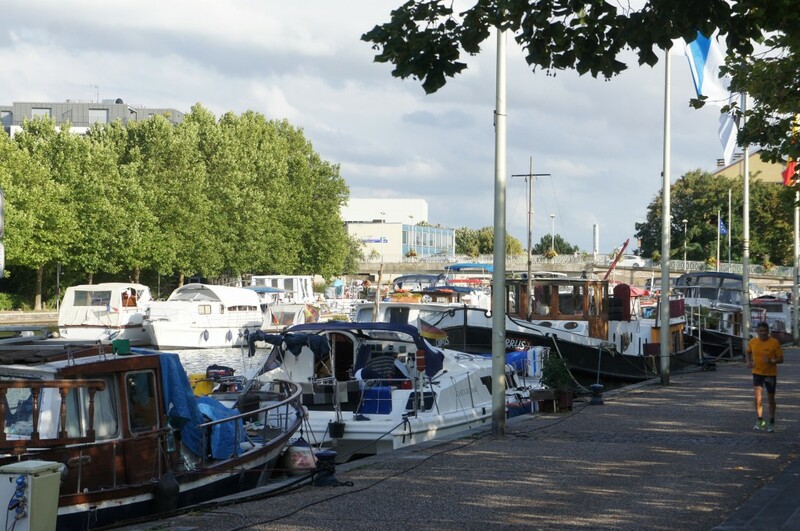 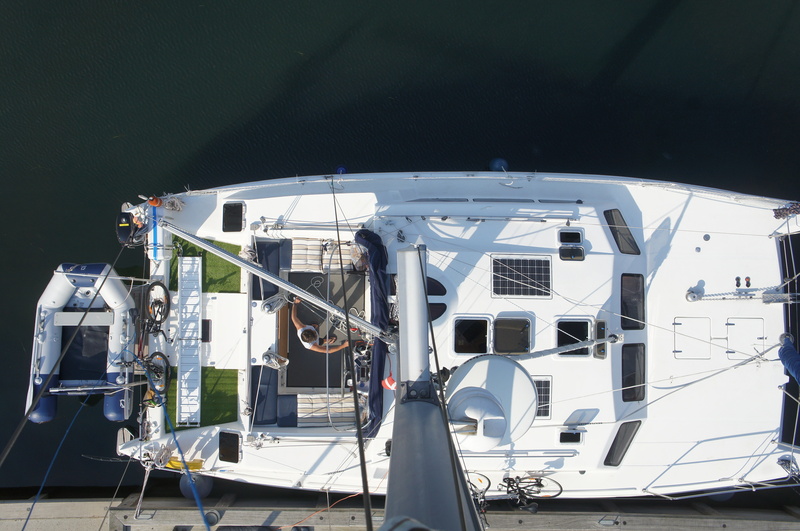 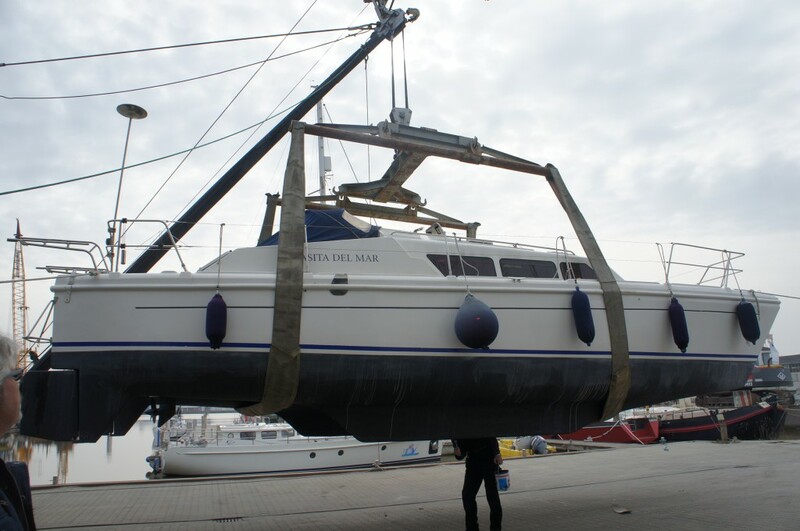 We put her in drydock for the winter, let the hulls be checked (for osmosis, an expert’s statement is available) as well as the technical equipment verified, and ordered new batteries, solar panels, water heater and some new equipment. 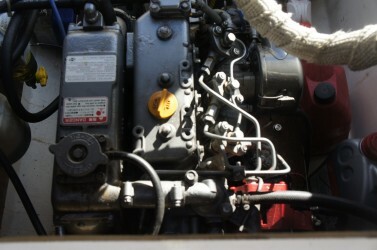 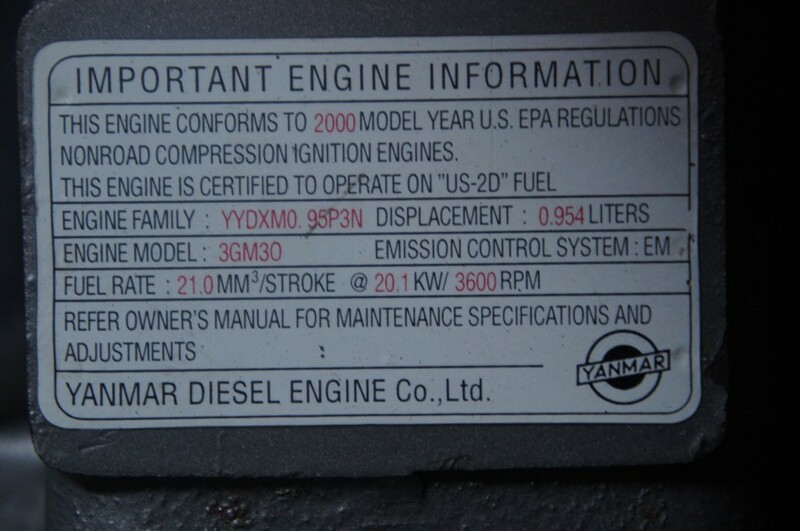 Engine (Single): Yanmar 3GM 30 Freshwater cooled Diesel. 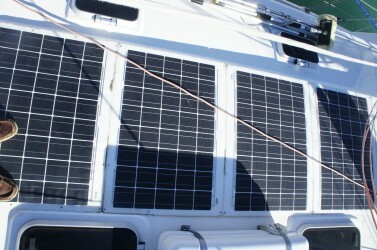 0,954l, 20,1KW, approx.1.100h. :: Regularly serviced, oil change (incl. 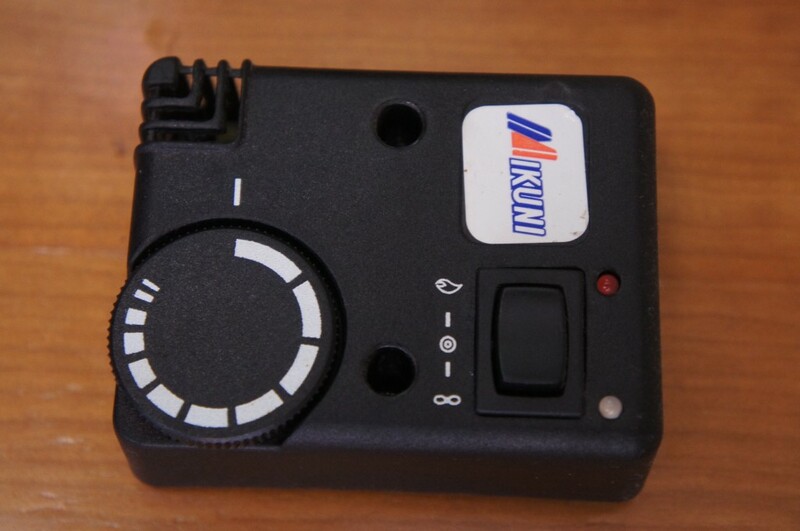 Filter) every 100h. 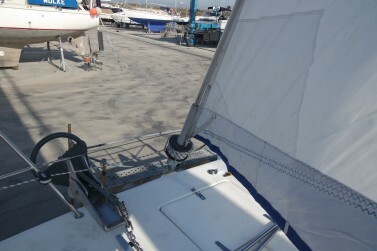 Prout outdrive with separate steering control and lifting mechanism which allows the outdrive to be lifted clear of the water when sailing. 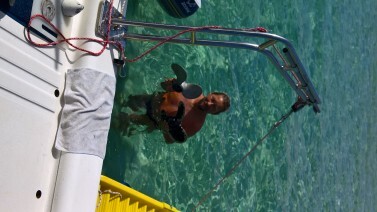 3 blade propeller. Steering: Hydraulic, new cylinder in 2013. 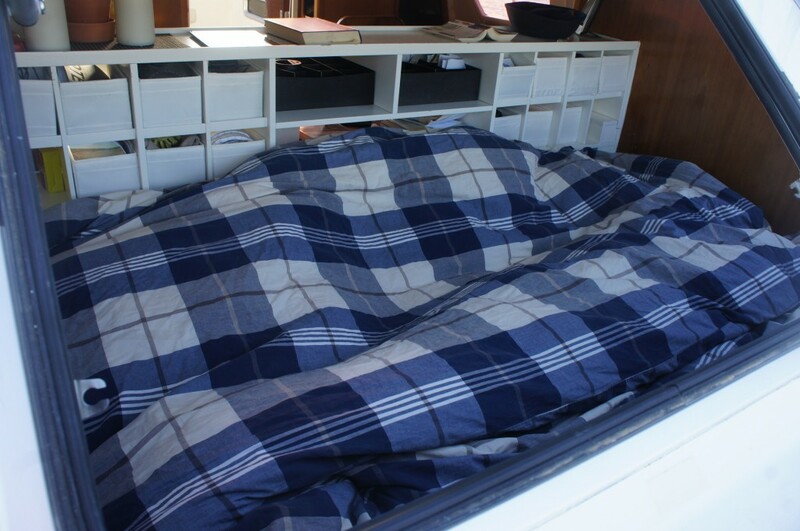 Sonic drive: Folding, new 2015. 2 Propellers with different pitches available. 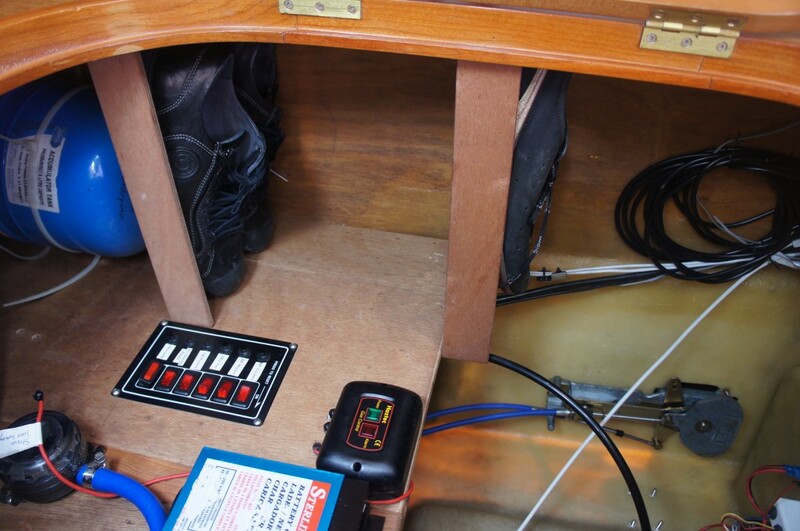 2 Batteries 180 AH, Bow Thruster, new 2015. 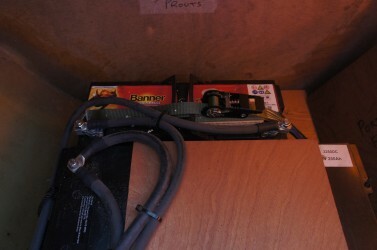 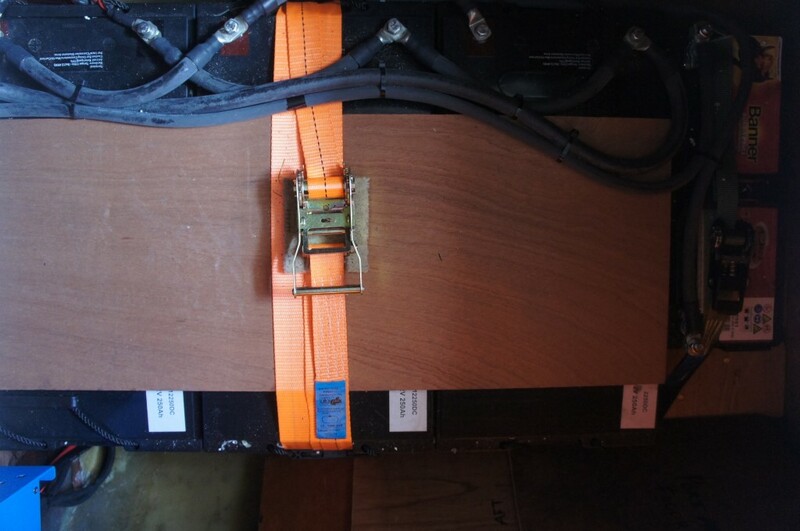 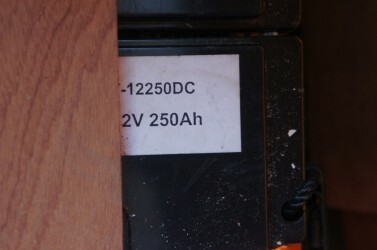 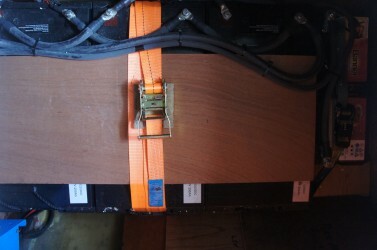 3 AGM domestic batteries 750 AH (2015). 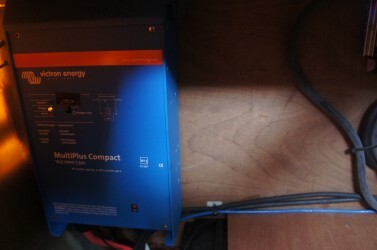 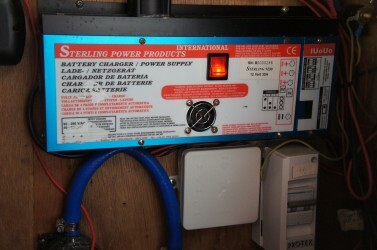 Inverter (Victron) 1.500W (2015). 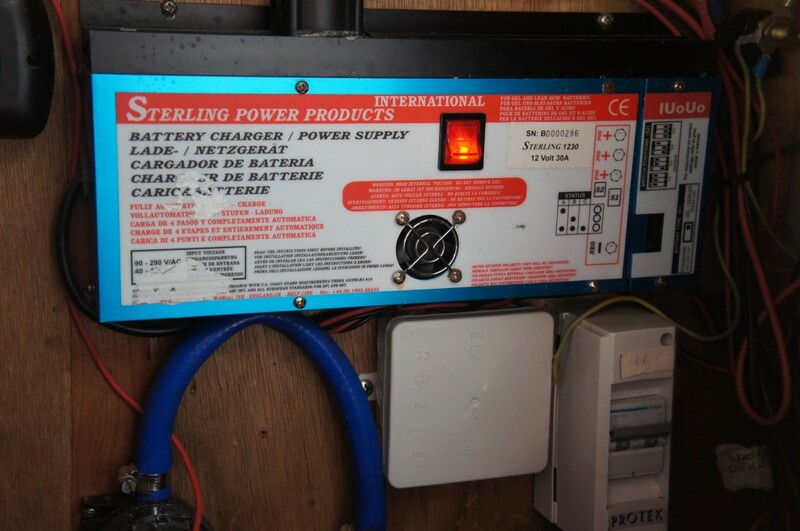 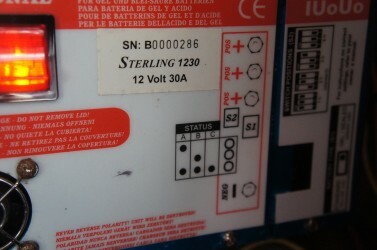 Charger 30A Sterling + 100A Victron (2015). 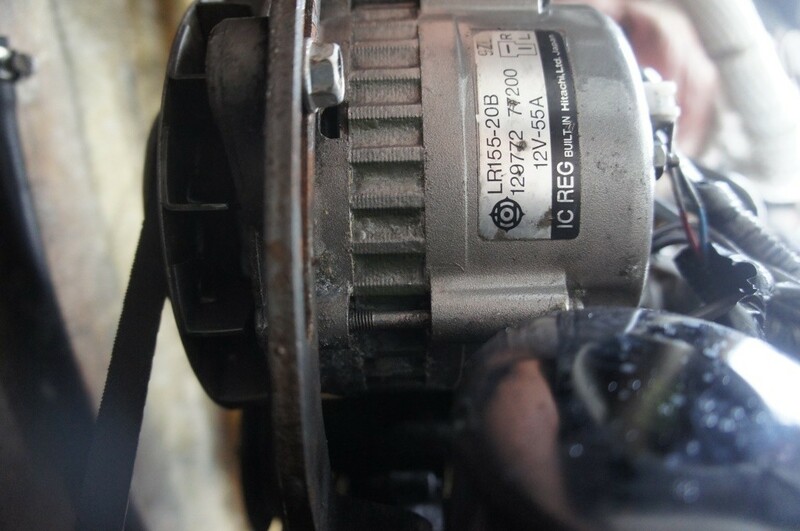 High Performance Alternator 165Amps (2015). 8 Solar Panels (2x 2014 + 6x 2015). 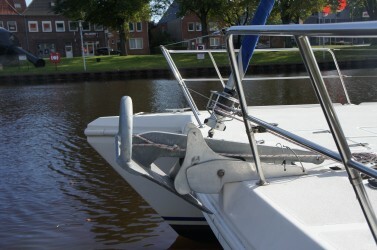 Shorepower. 10 sockets 230V, 6 USB Sockets. 3 double cabins plus a total of 2 berths possible in Saloon. 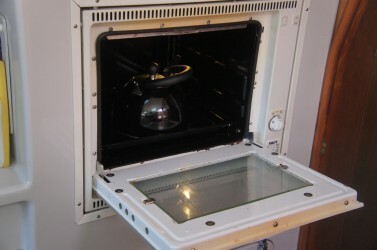 Good galley, excellent heads and navigation table. 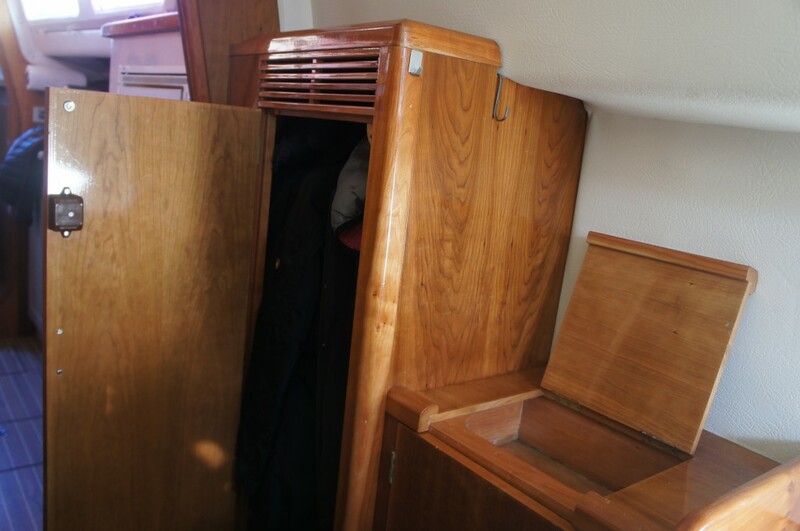 Cherry wood throughout. New upholstery in the Saloon. 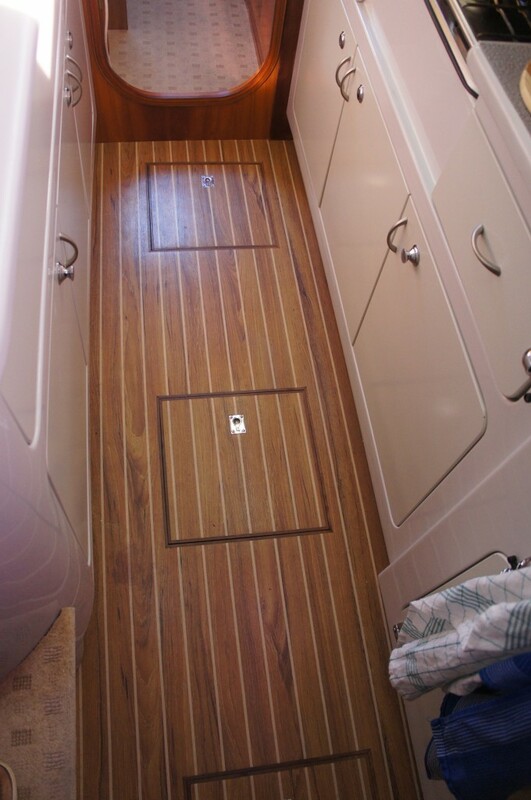 Teak (laminat) and Holly floors throughout. Vinyl deck head and hull side linings. 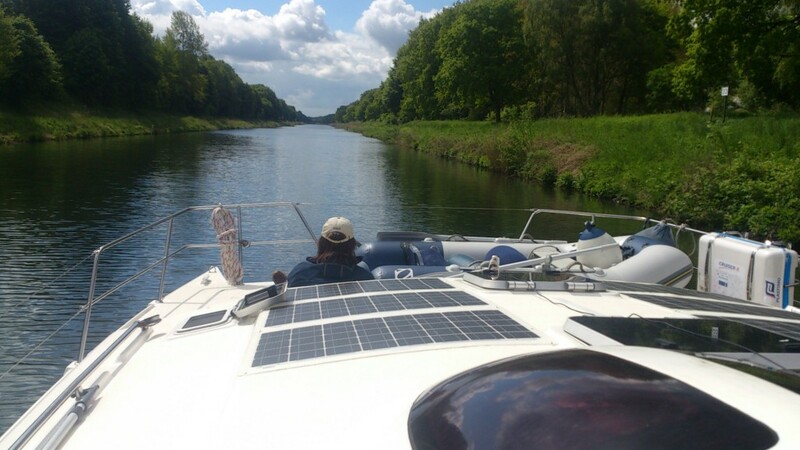 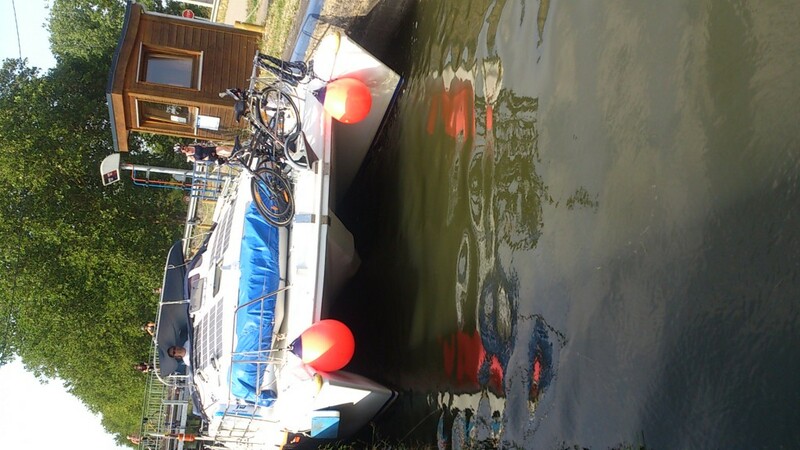 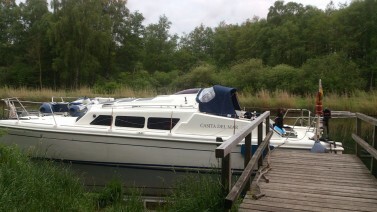 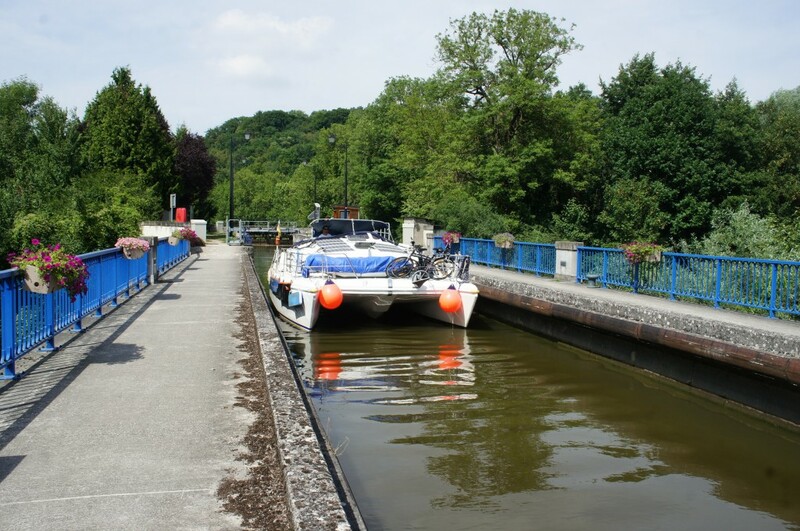 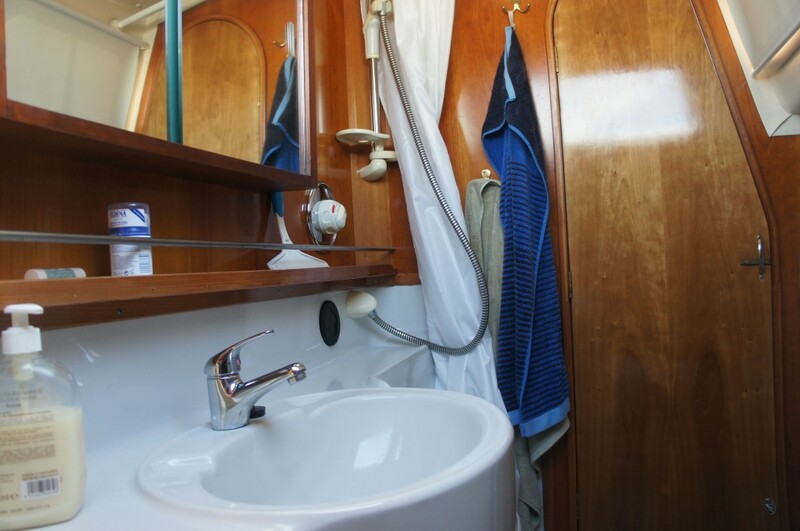 Sleeps 4 in 2 double cabins, 2 in Master Cabin behind the Saloon table. 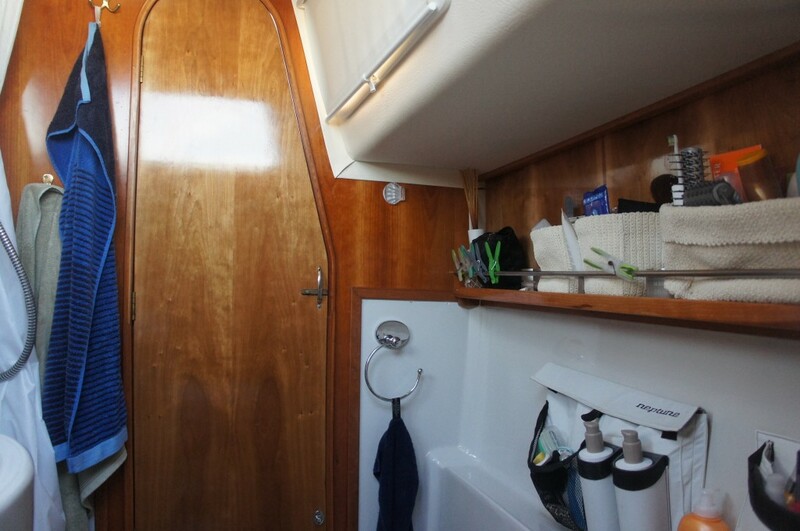 Plus Saloon. 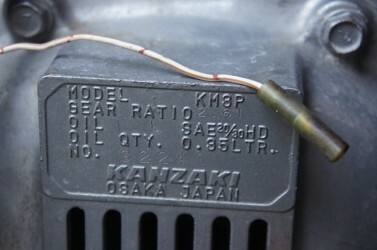 Mikuni Diesel cabin heating throughout. 14 sunblinds “Oceanair”, mosquito screens for several windows. Fully moulded berth c/w crash tank, floor and integral fridge and huge freezer (2014), seawater cooling system. 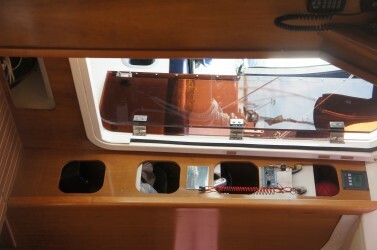 Opening portlight to cockpit. 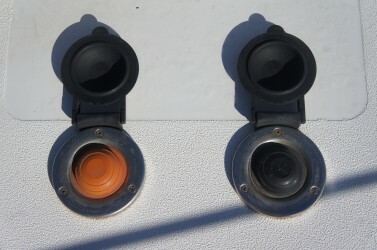 Bulkhead light. 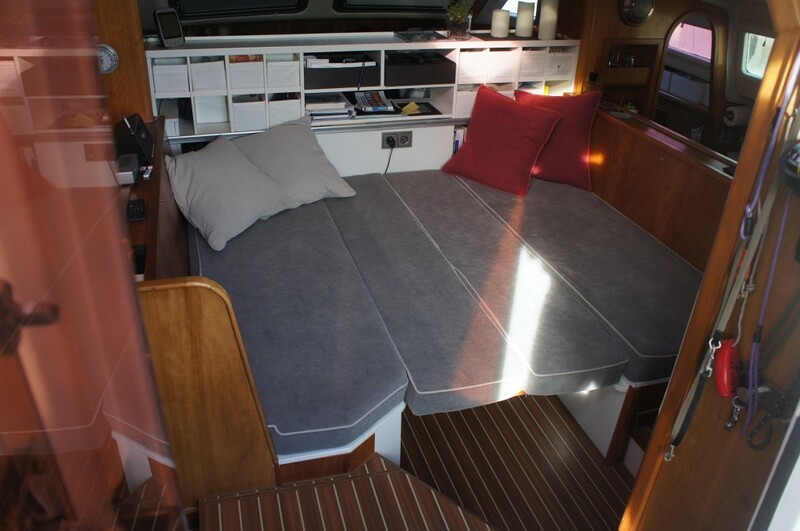 Soft textured linings. 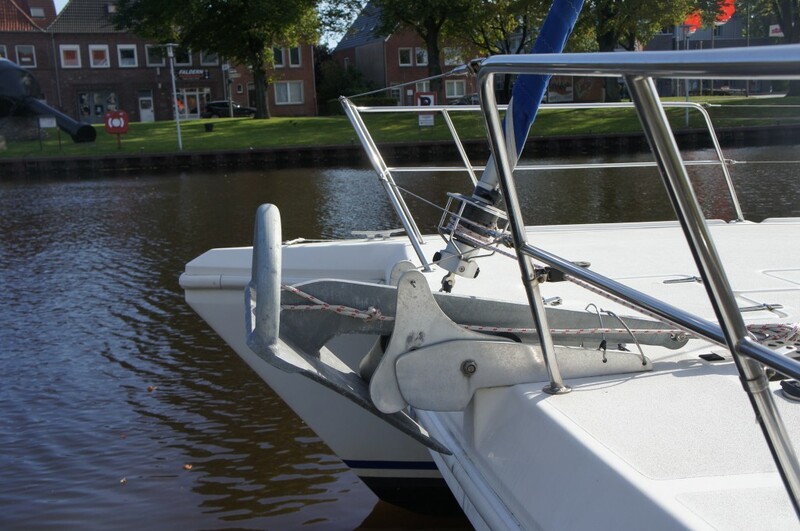 Access to steering arm. 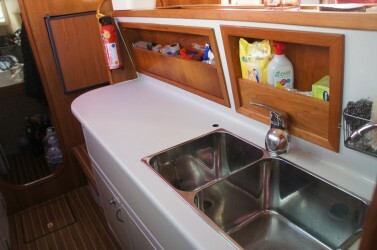 Double sink, hot and cold pressurized freshwater supply + seawater. 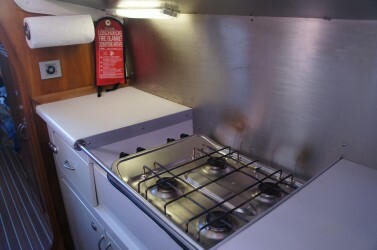 4 burner hob c/w fiddles and heat shield and drawers, oven and grill unit. Opening doors, shelves and drawers. 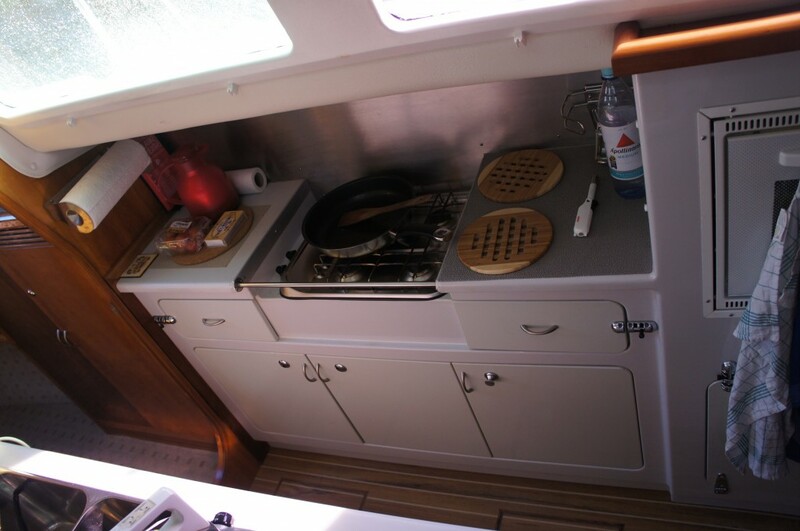 Moulded work-surface and backsplash. 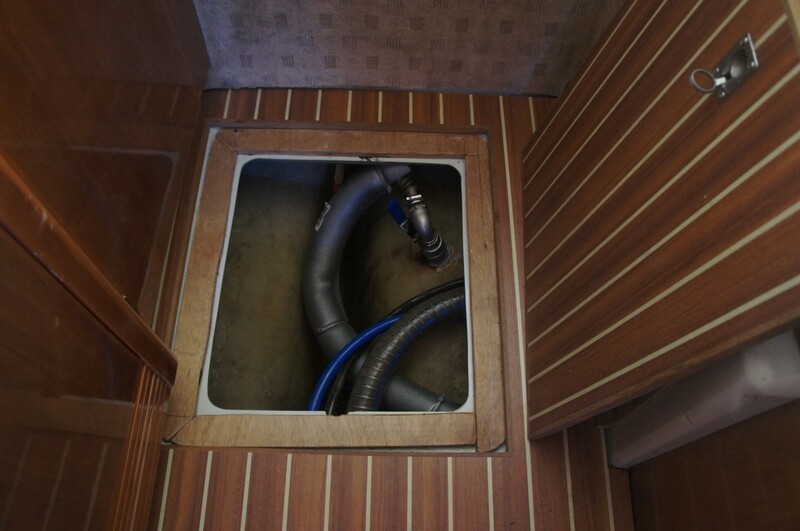 40 gallons water tank under floor moulded in keel, vent & three inspection covers. 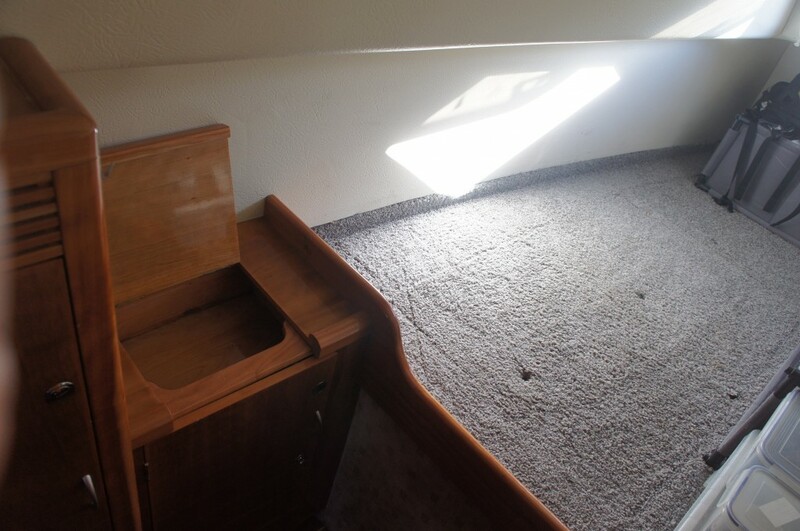 Steps to saloon. 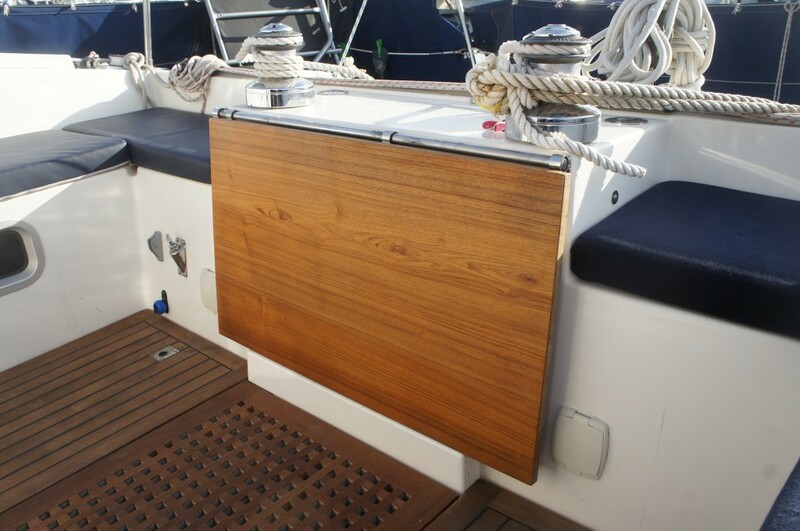 Soft textured lining, veneered bulkheads. 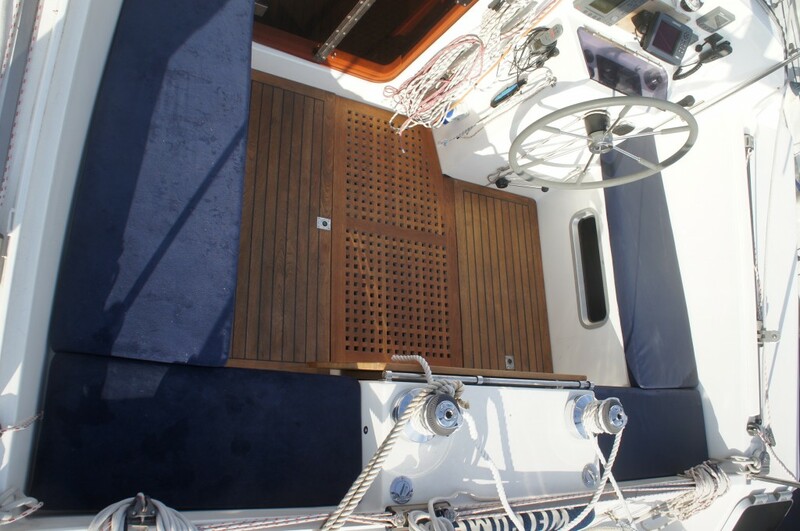 Opening deck hatch. 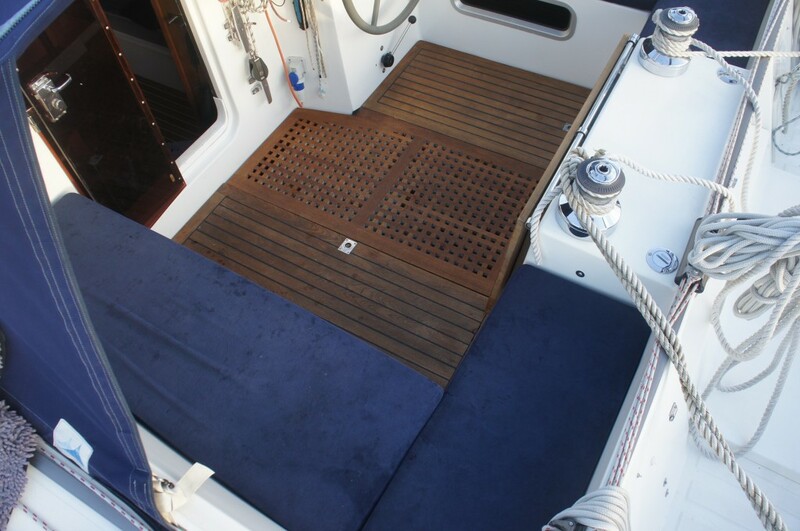 Teak floor covering. Waste bin. 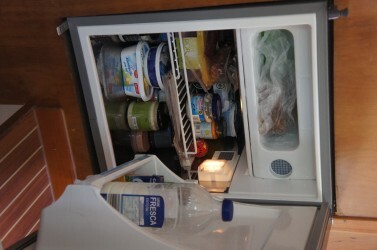 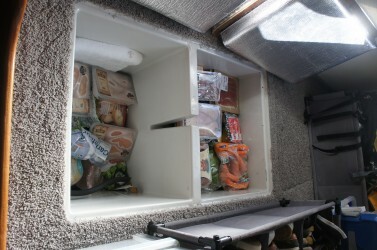 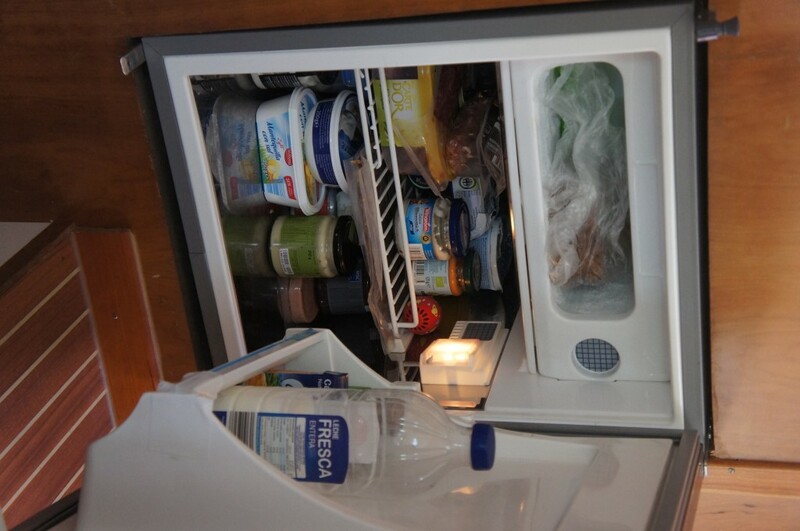 Coolmatic Fridge 12V/ 230V. 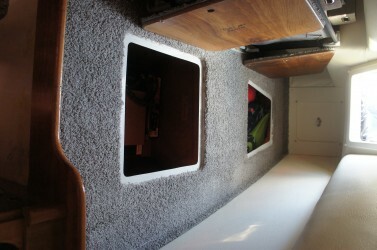 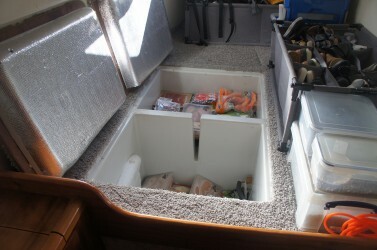 Fully moulded double berth and cabin floor. 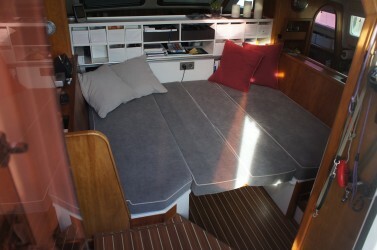 4” covered cushions. Opening portlight to cockpit. 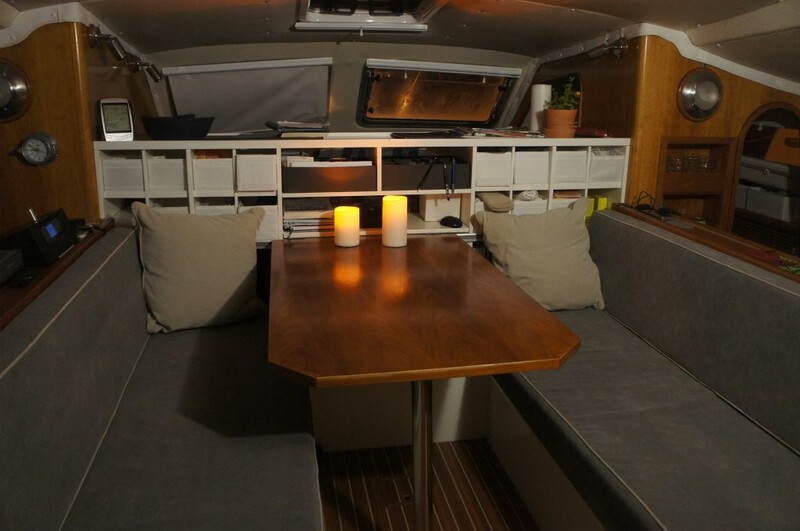 Bulkhead light, Soft textured linings. 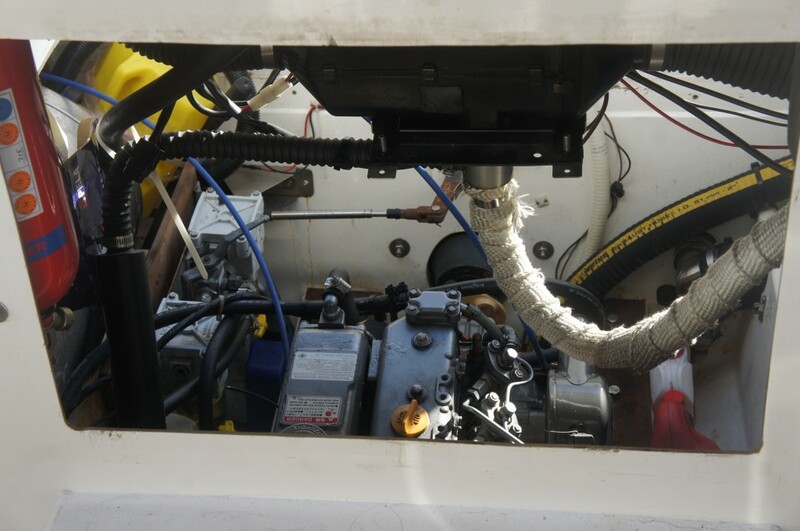 Access to steering arm. 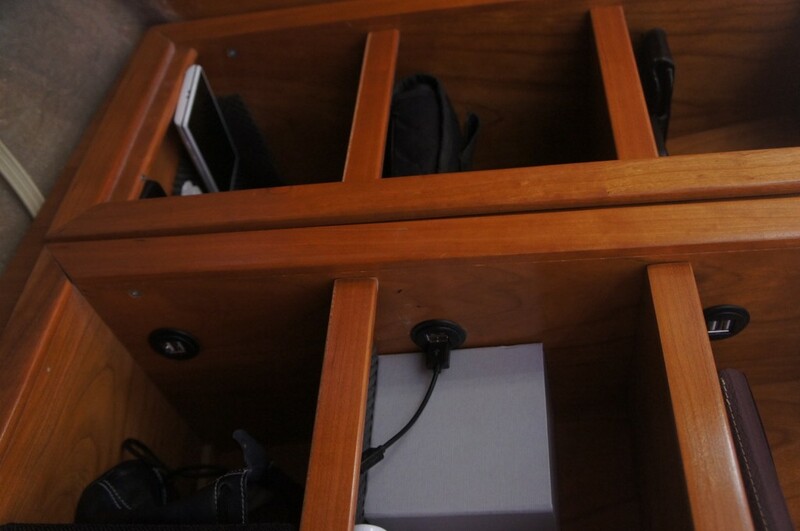 Lockers. 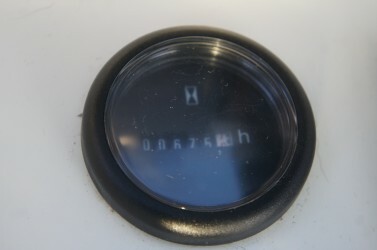 Opening hatch aft. 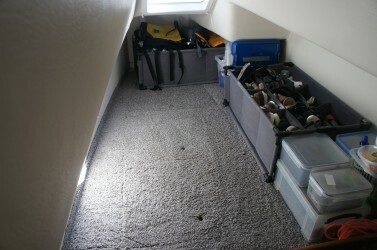 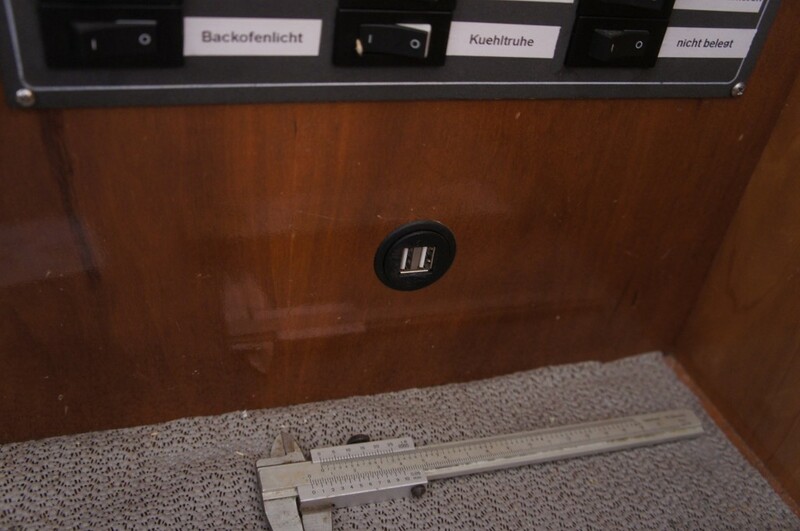 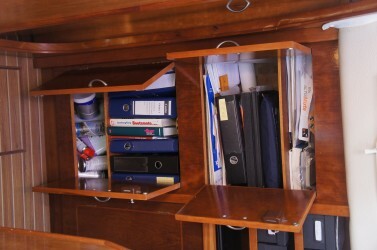 Several storage lockers, full size chart table with chart stowage under shelf. 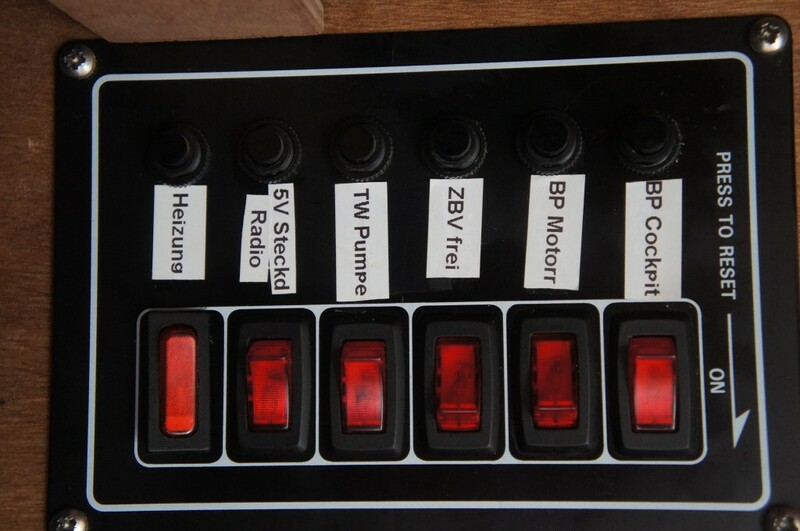 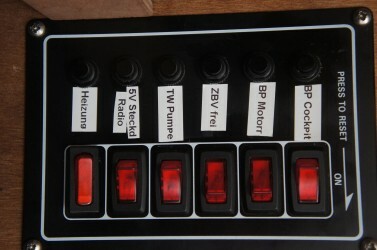 DC switch panel with circuit breakers. Chart light. 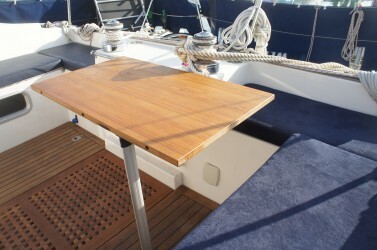 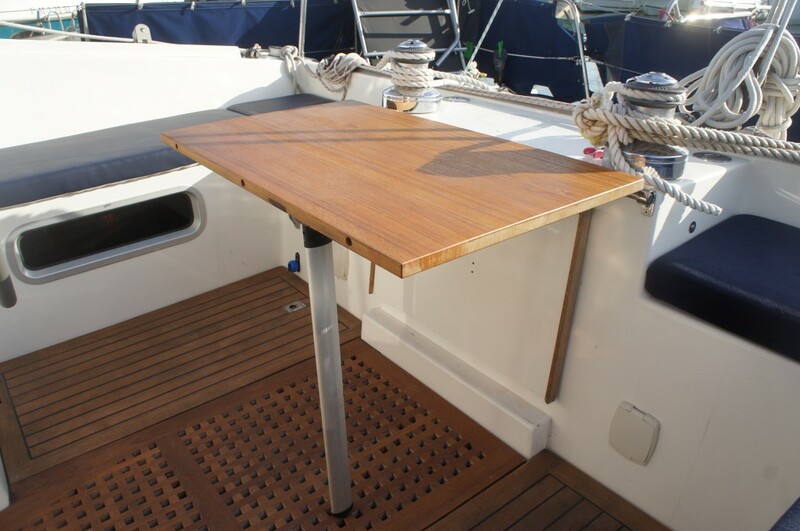 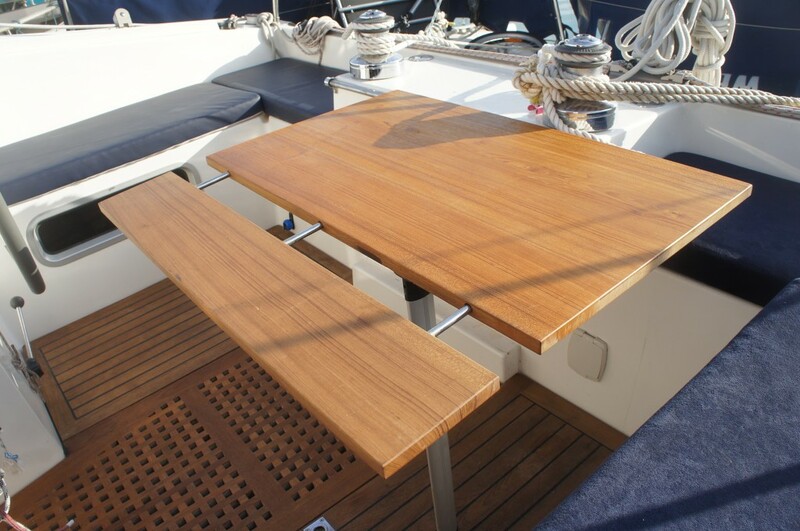 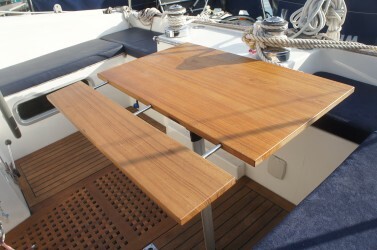 Chart table seat unit. Water tank (40 gal.) 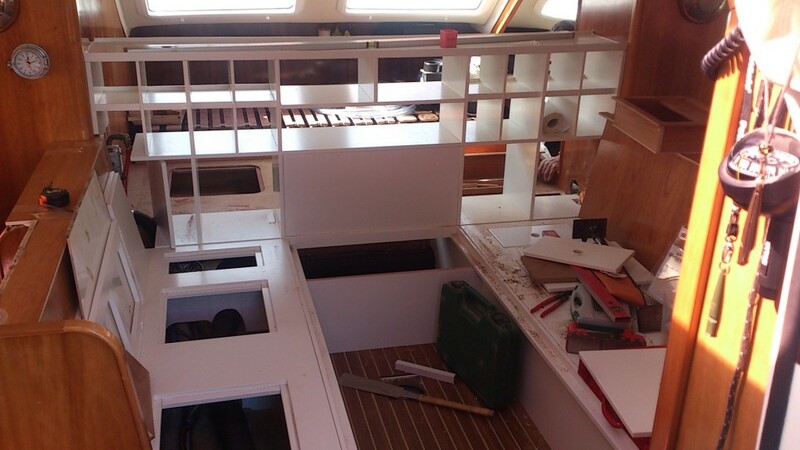 under floor moulded into keel, vent and three inspection covers. 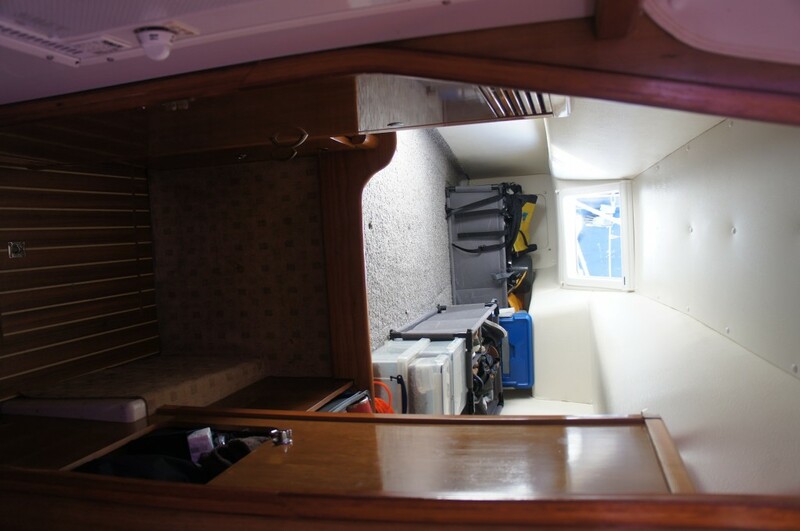 Steps to saloon. 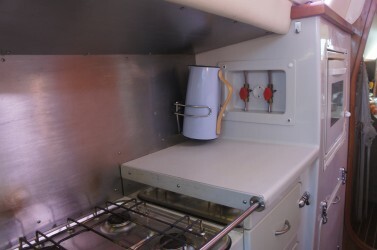 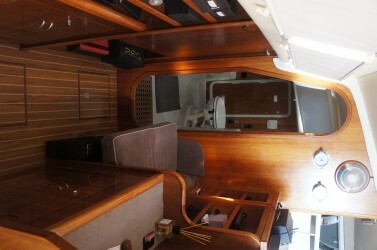 Linings as galley with hull lining in lieu of backsplash. Teak Floor. 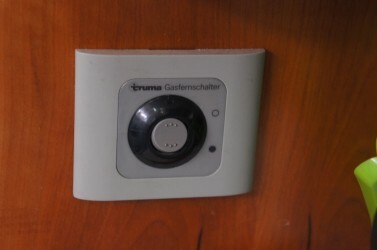 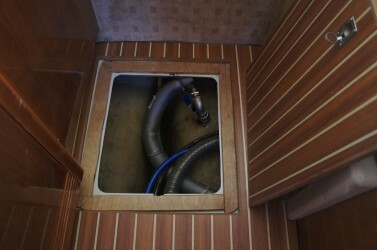 Toilet/ shower compartment: Hot and cold pressurized water supply. 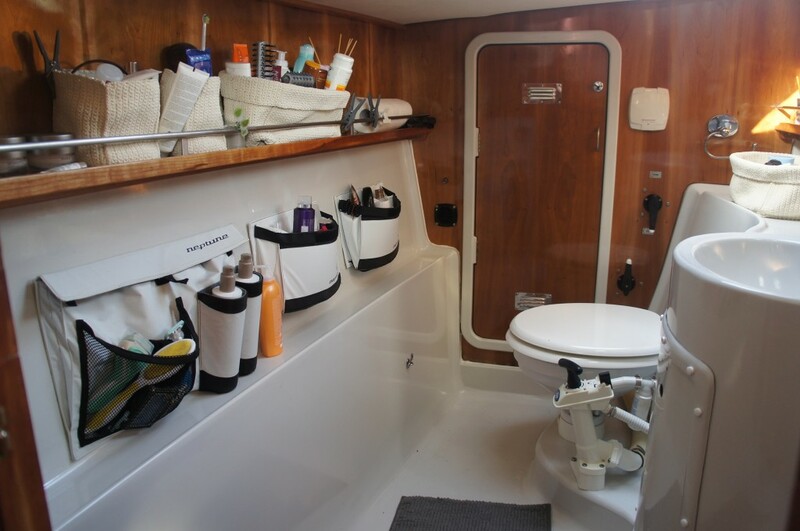 Fully moulded wipe-down head unit, washbasin unit c/w inlet and outlet both fitted with seacocks. 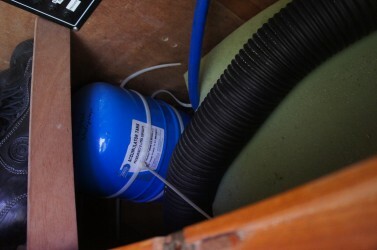 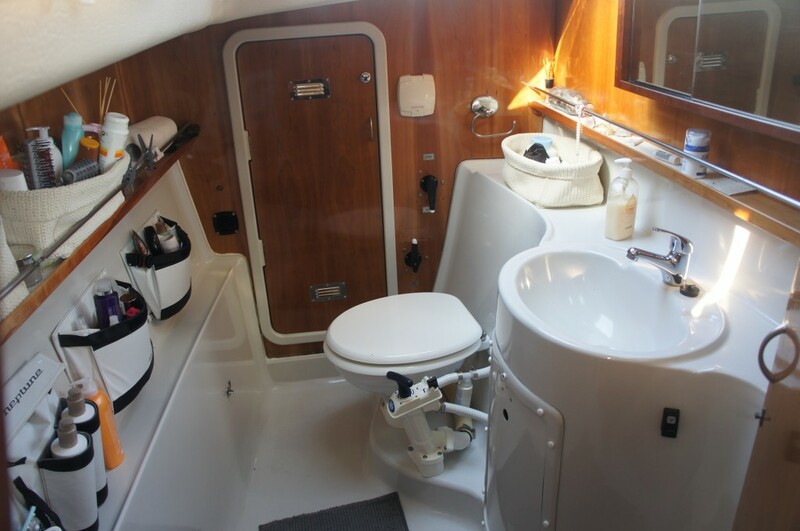 Sea toilet c/w inlet and outlet both fitted with seacocks. Shower tray and teak grating. 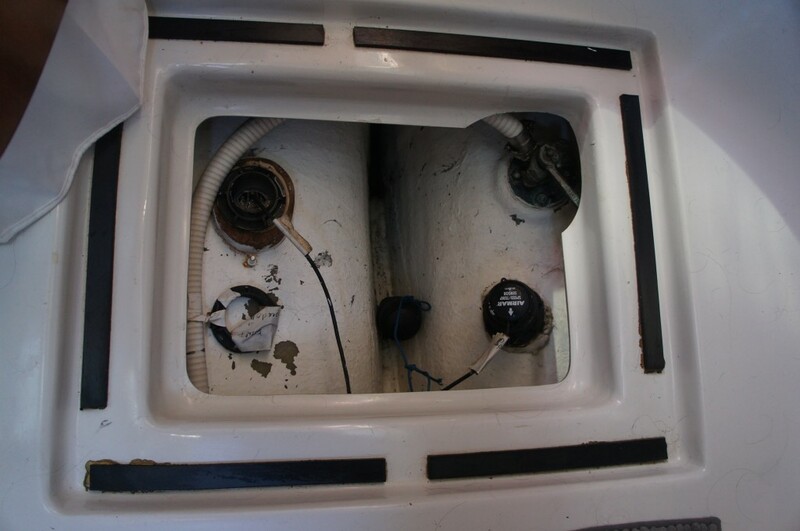 Electric shower tray pump out. 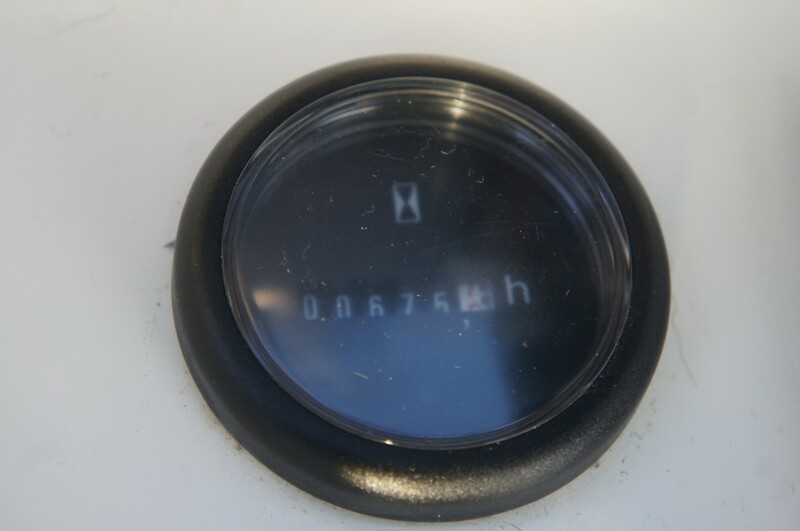 Mirror. 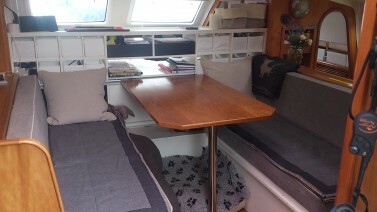 Soft textured linings. Crash bulkhead. Opening deck hatch. 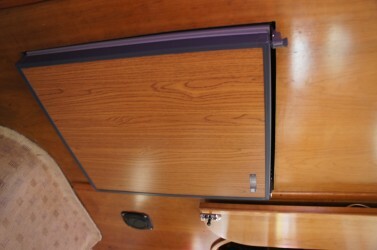 Towel rail and accessories. 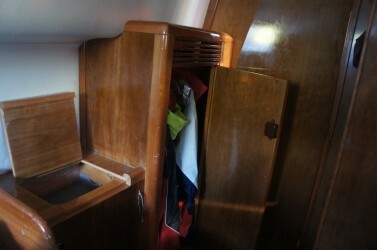 Door to forward stowage area suitable as oilskin hanging area. 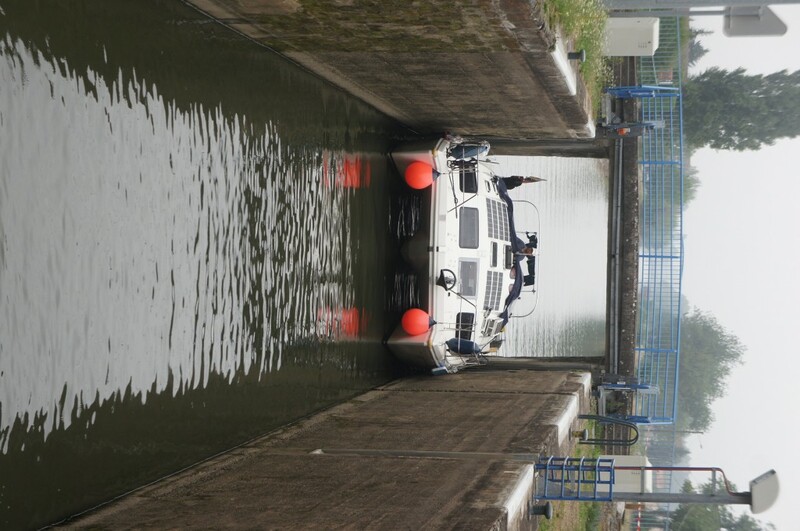 Access to bow thruster. 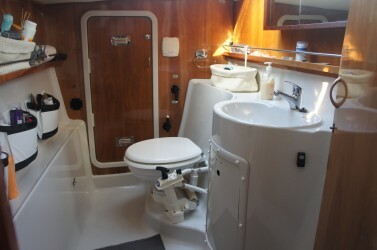 Jabsco Marine Toilet 2011, all pipes new (2016). 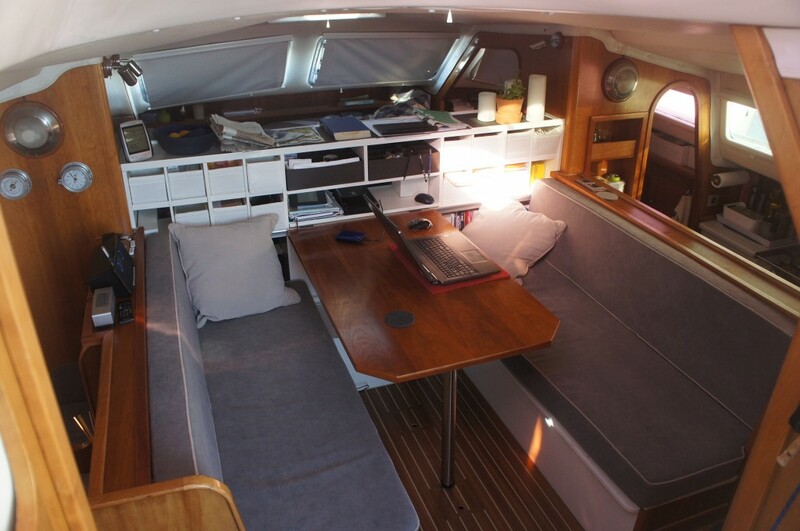 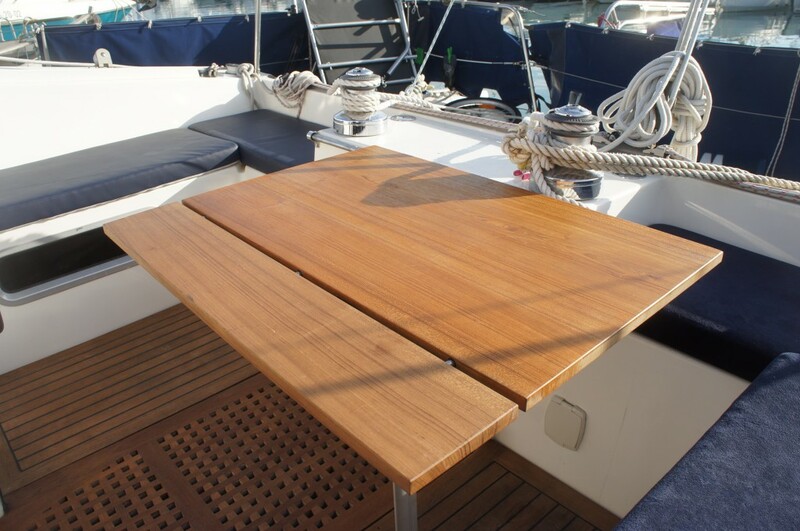 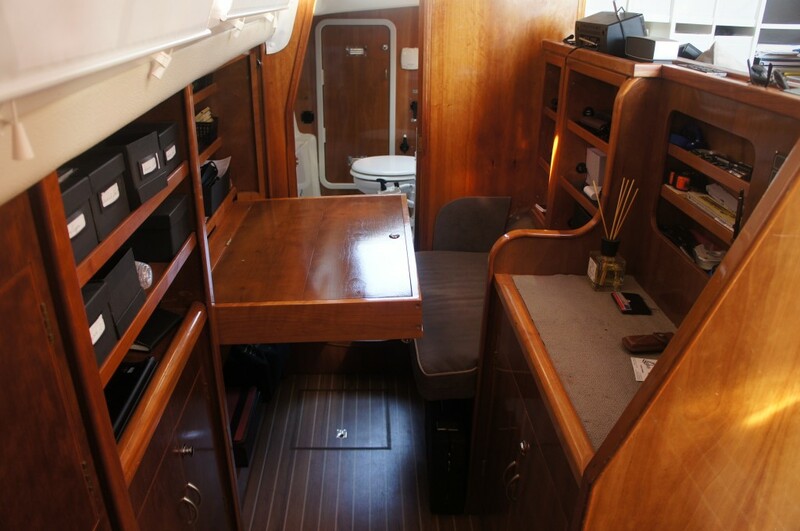 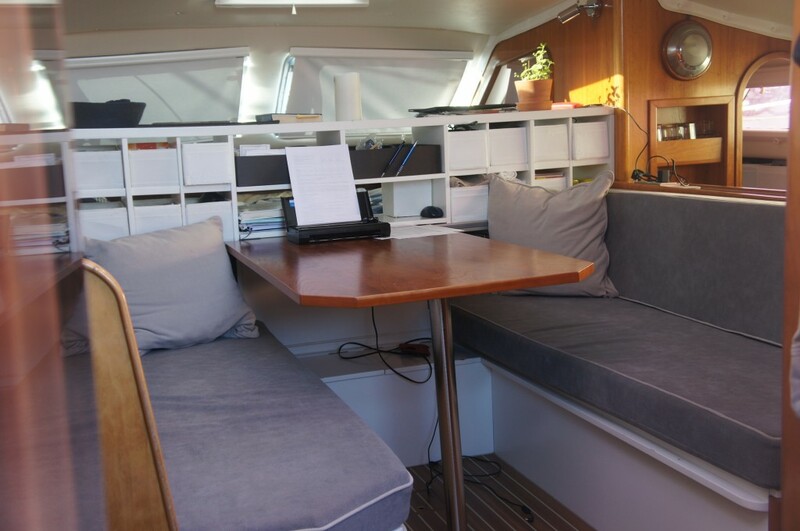 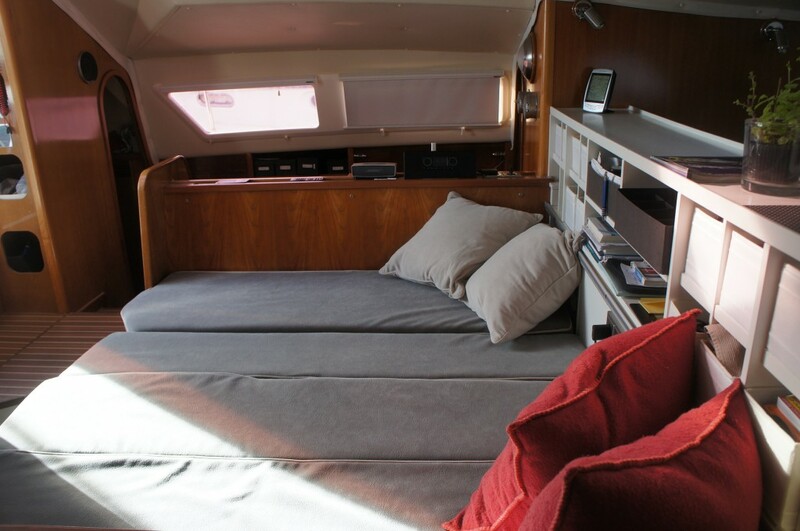 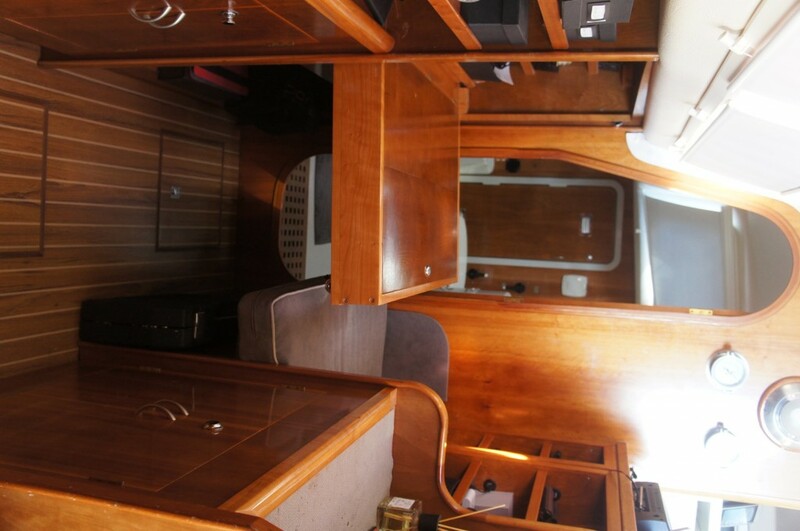 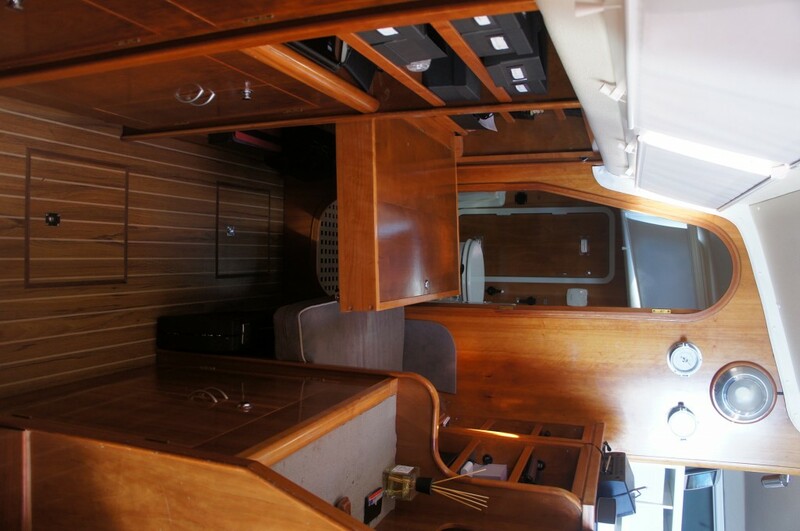 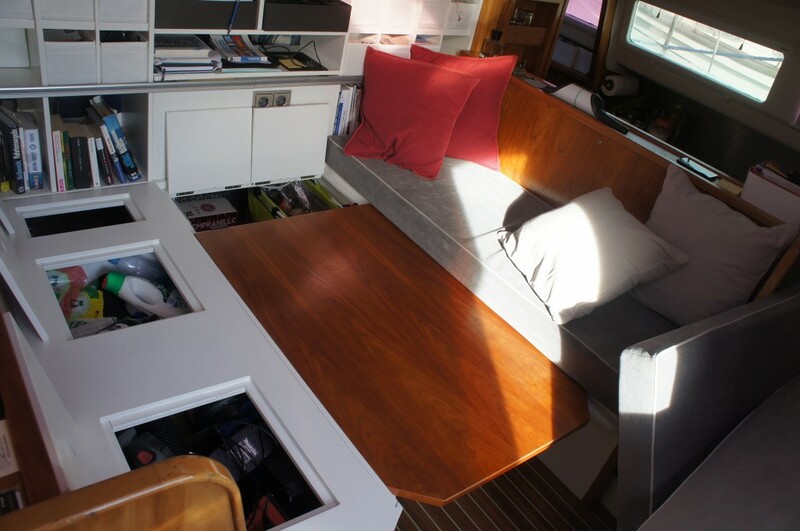 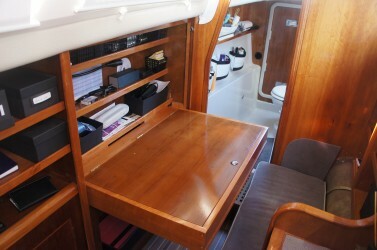 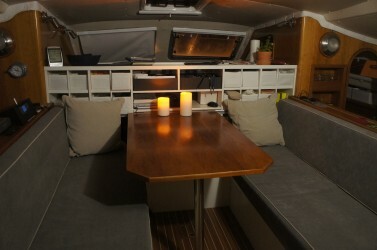 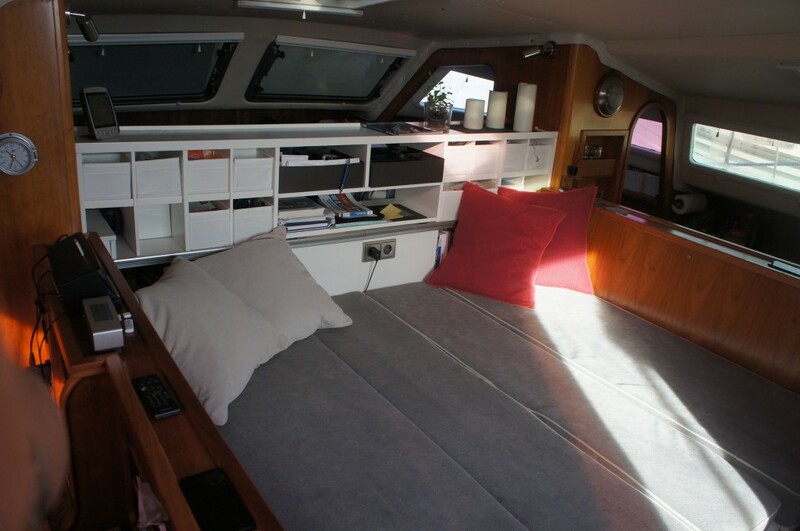 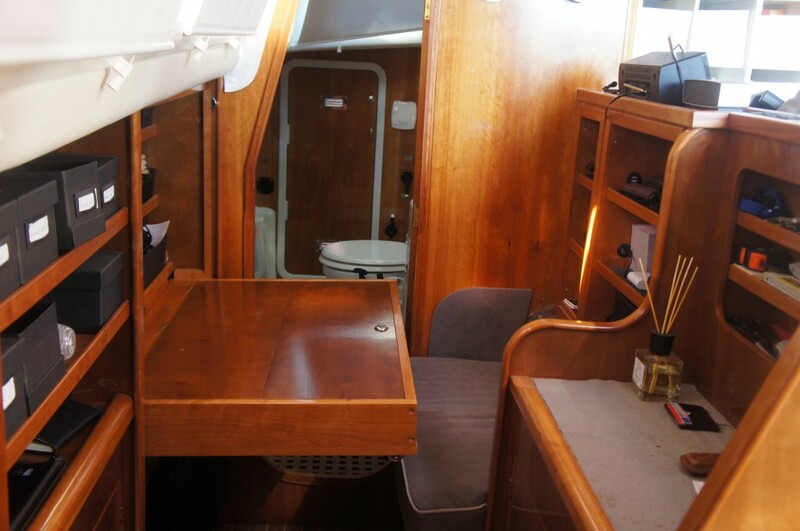 Lacquered table (+ a second, bigger one) with the possibility to form occasional double berth with infill cushion. 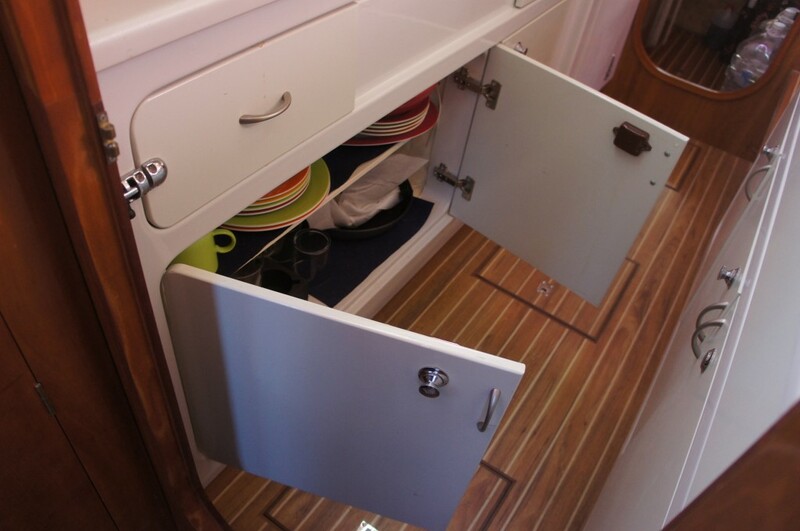 Main companionway bifold perspex door. Soft textured linings. Opening deck hatches. 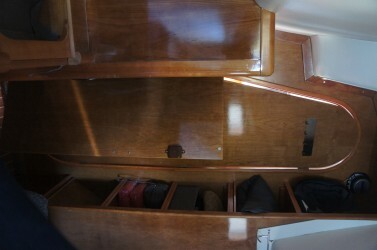 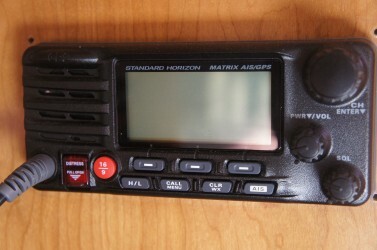 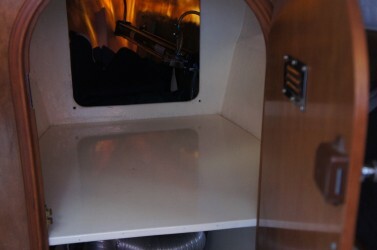 Large hanging locker with access to steering console/ electronics. 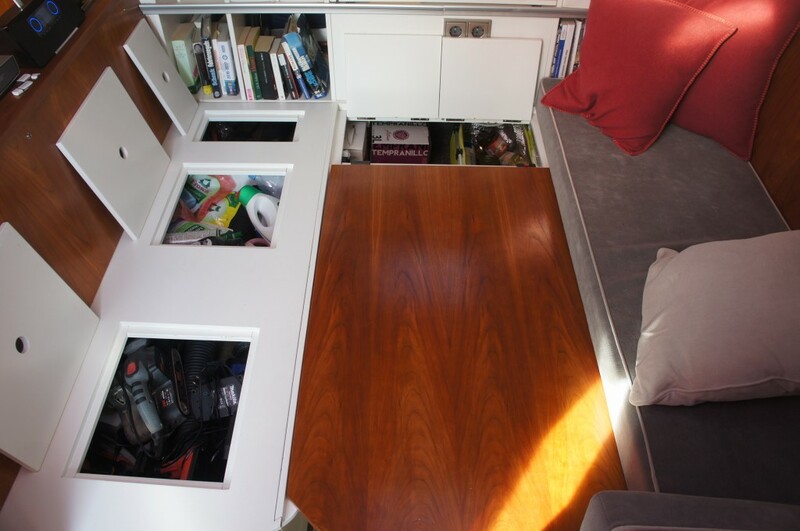 Large stowing spaces. 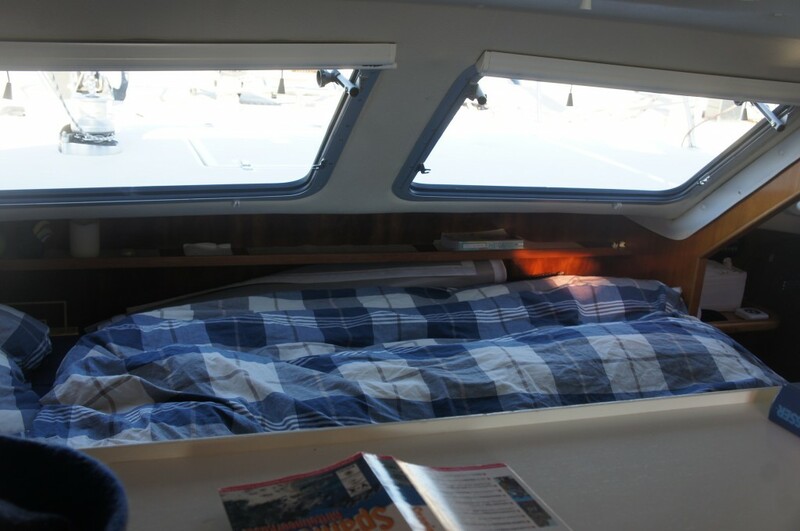 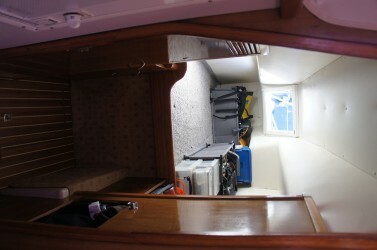 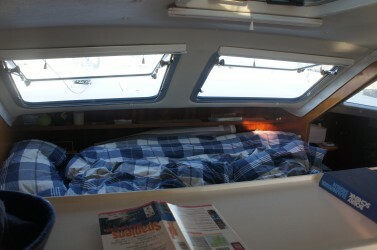 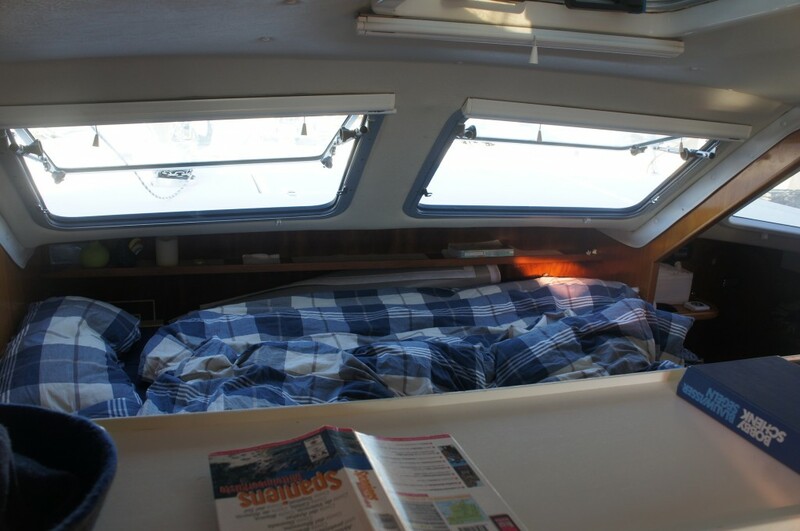 Double berth/ Master cabin at forward end of saloon. 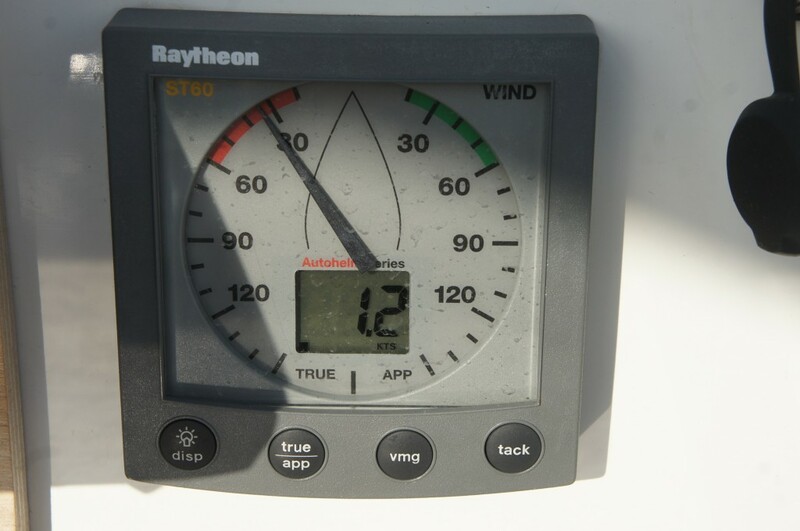 Watch and Barometer. 2 windows in the front new, can be opened. 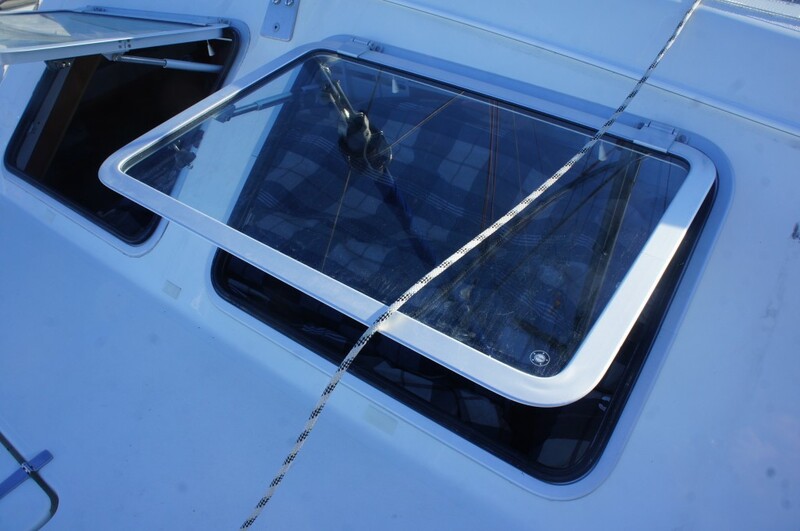 2 dome windows. 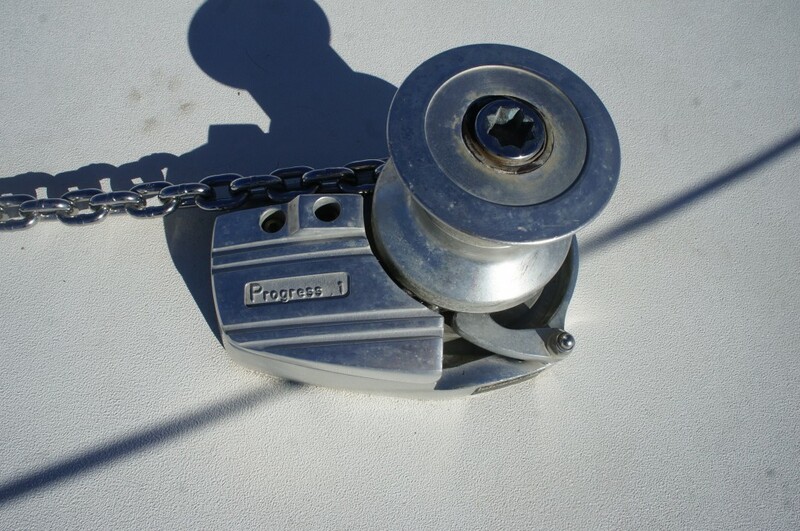 2 spring cleats, 5 x 10”cleats. 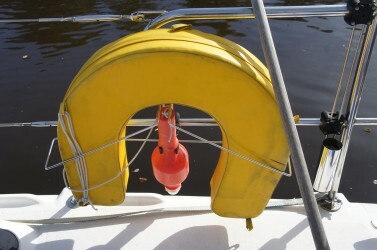 A heavy duty self stowing bow roller. 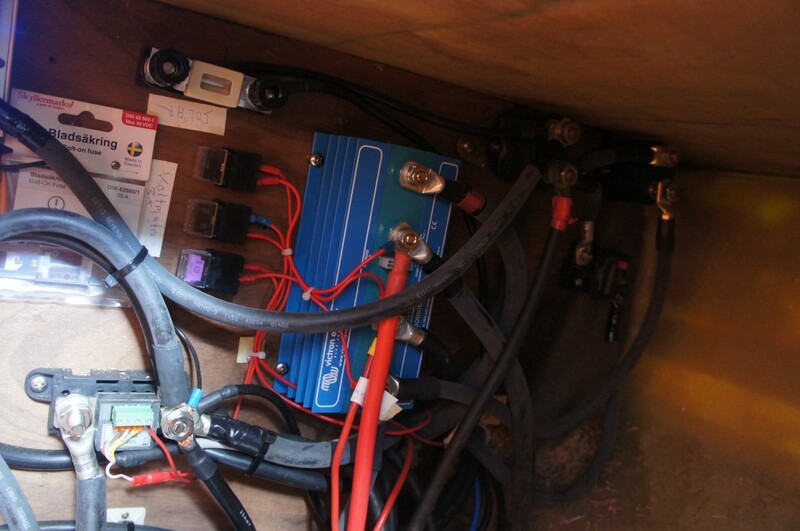 2 genoa tracks and cars. 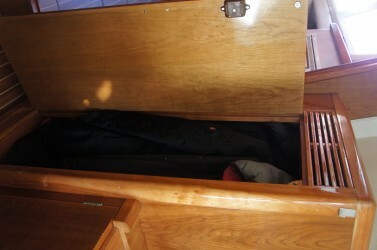 2 staysail blocks. 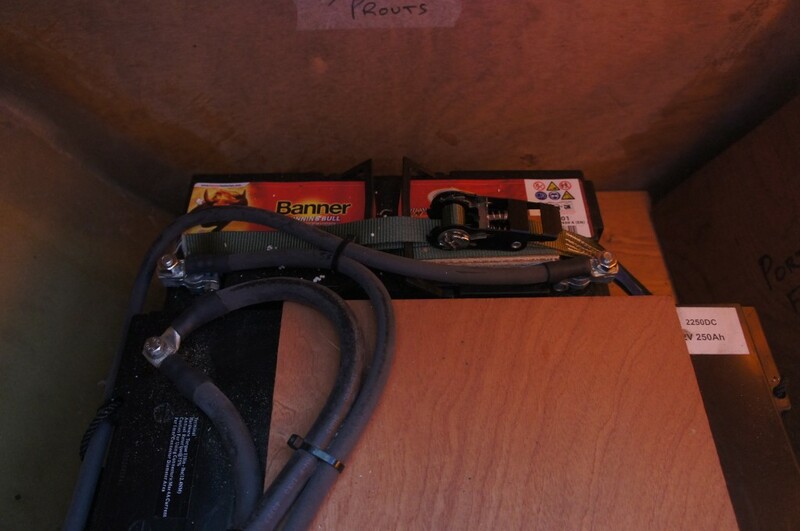 Set of chainplates 8 of. 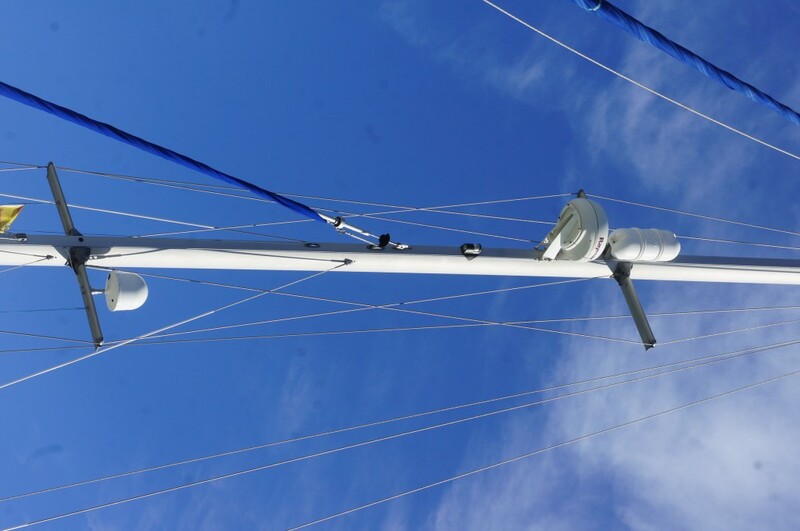 Double lifelines and stanchions. 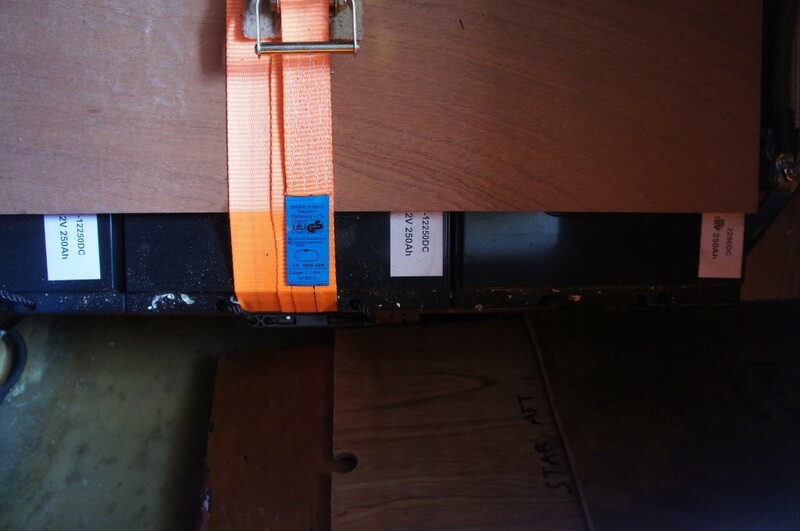 Double rail s/s pushpit. 2 genoa sheet winches (2 speed) self tailing with handles. 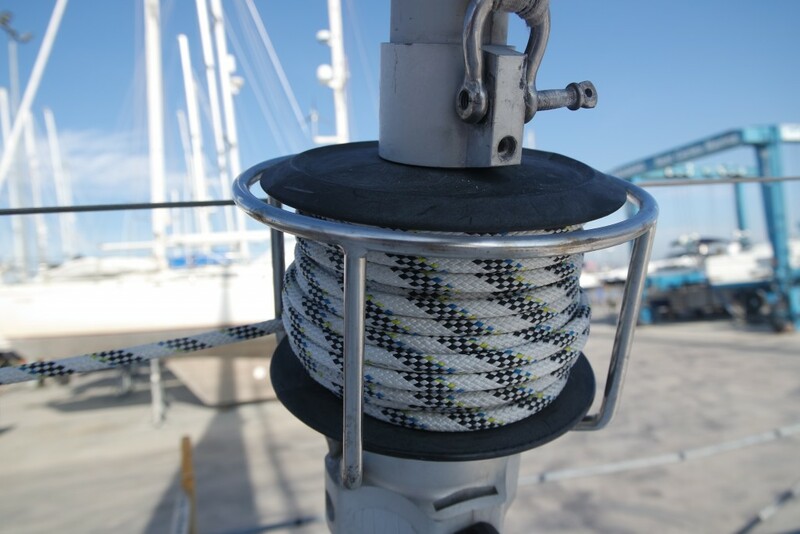 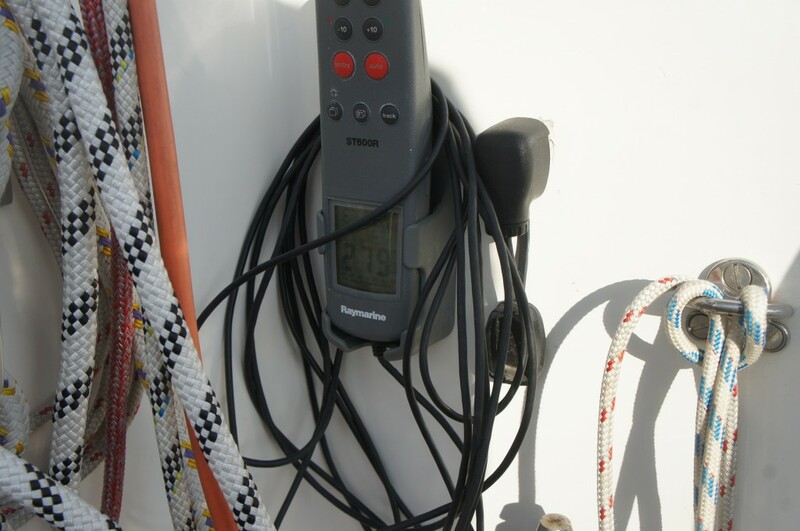 1 halyard winch. 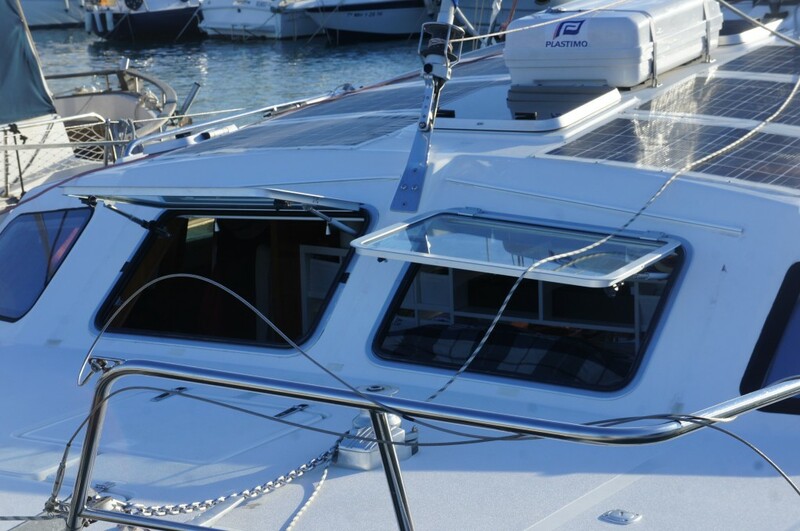 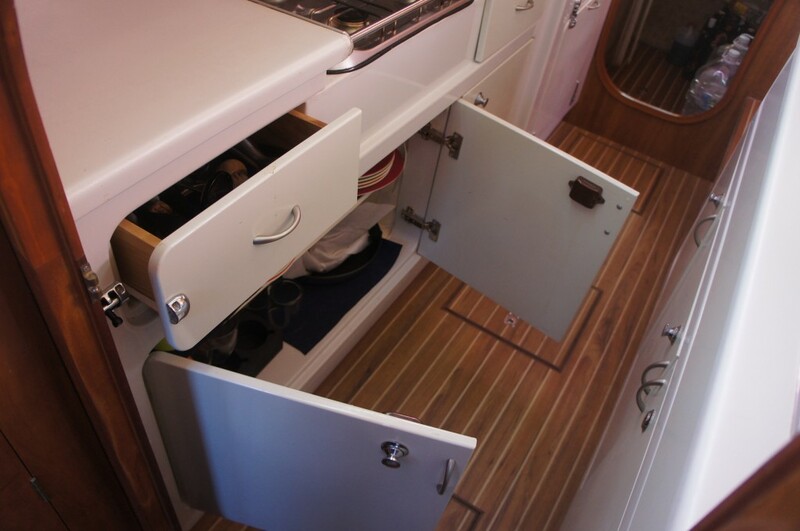 7 Aluminium opening deck hatches 3 small, 4 large. 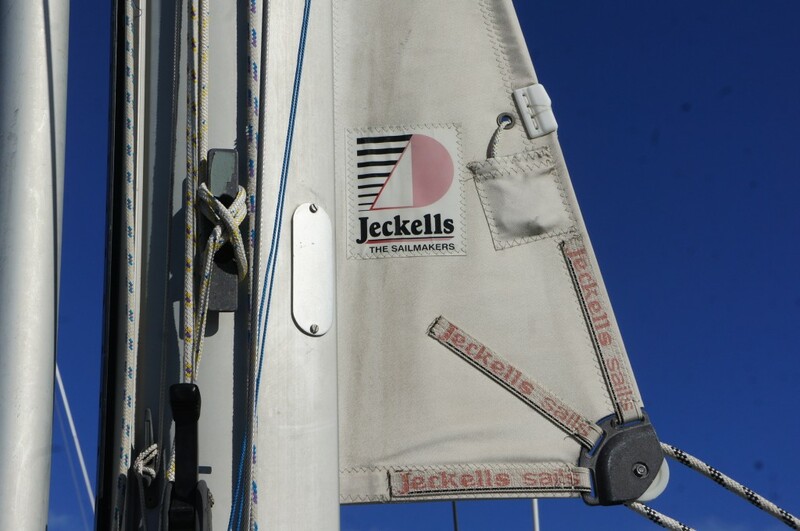 1 mainsail track, traveller and stops. 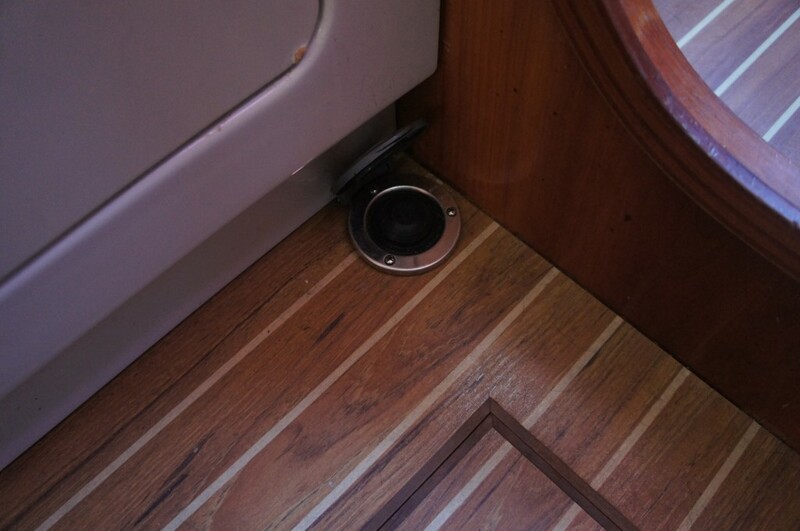 2 deck water fillers. 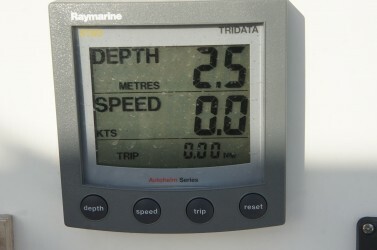 Bulkhead mounted compass. 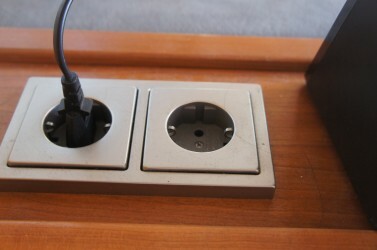 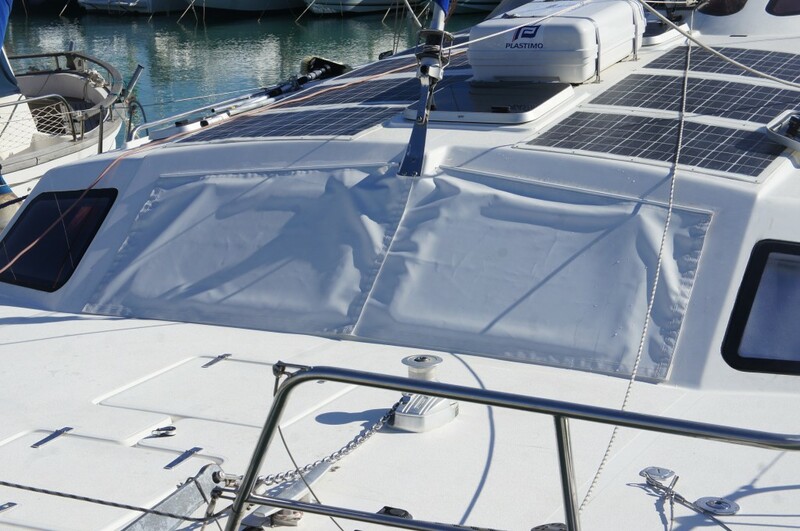 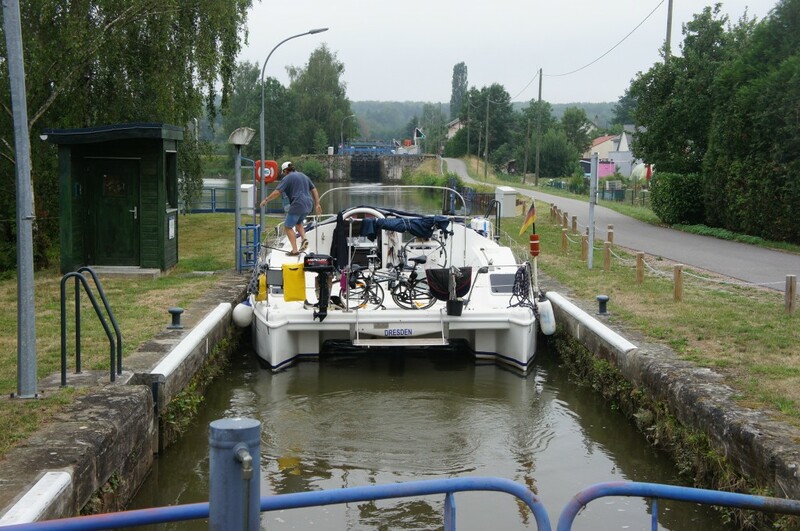 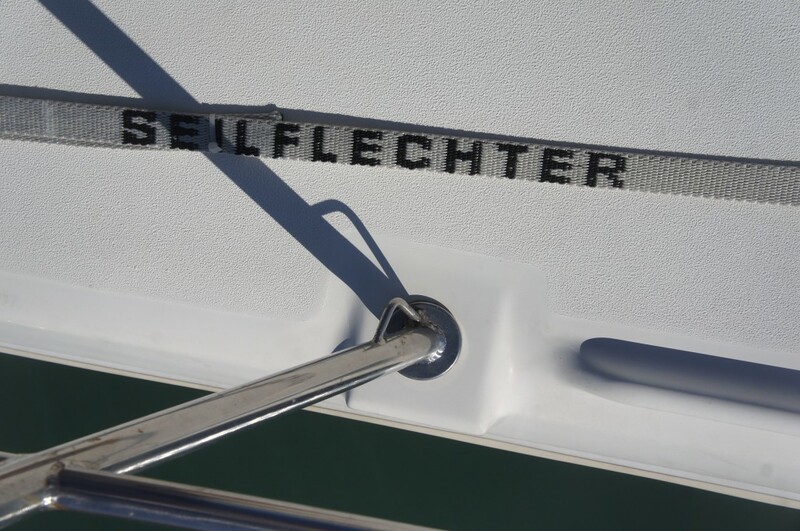 2 self draining foredeck lockers for anchor, chain, sails and gas bottles. 2 cockpit lockers. 1 integrally moulded steering and instruments console with hinged plexiglass lid. Stainless steel handrails.Bi-fold perspex companionway door with GRP surround. Stern decking with non-skid finish. 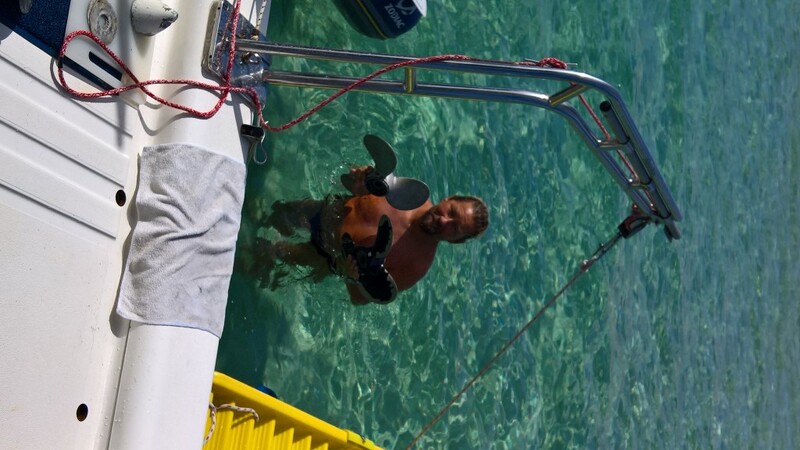 Simpson s/s Davits. 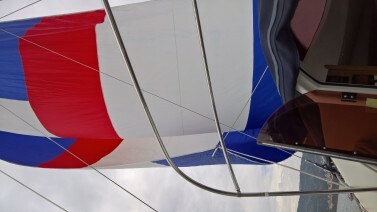 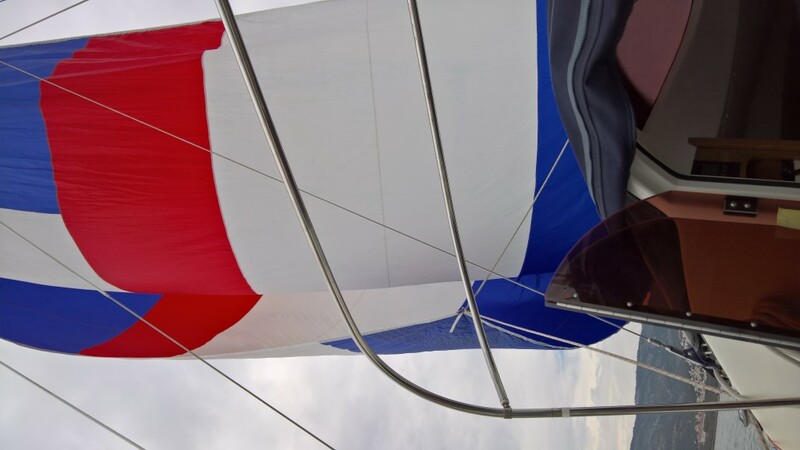 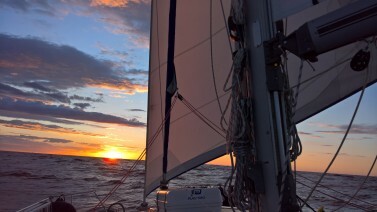 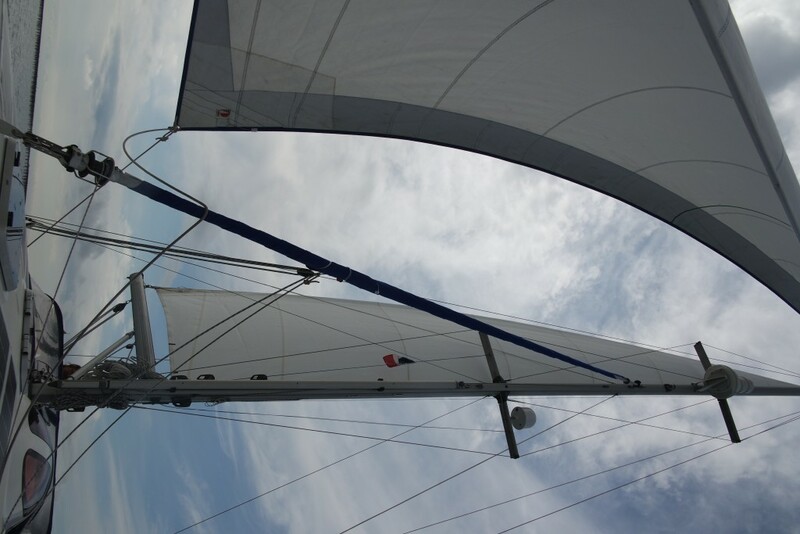 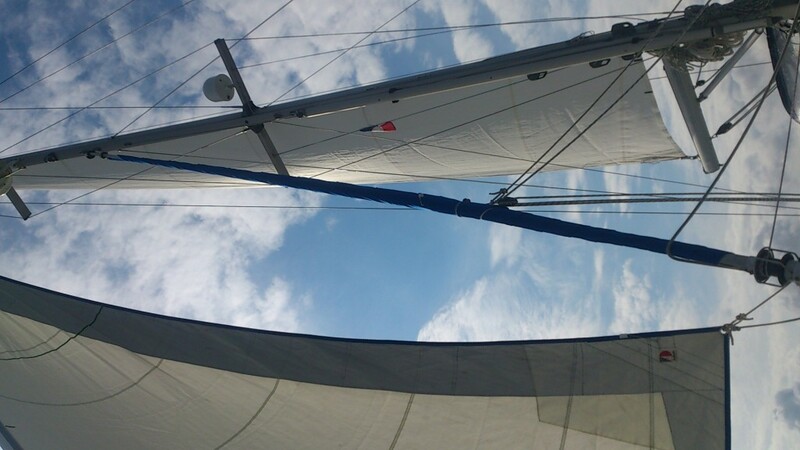 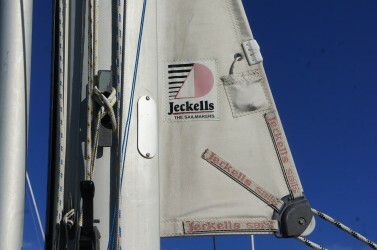 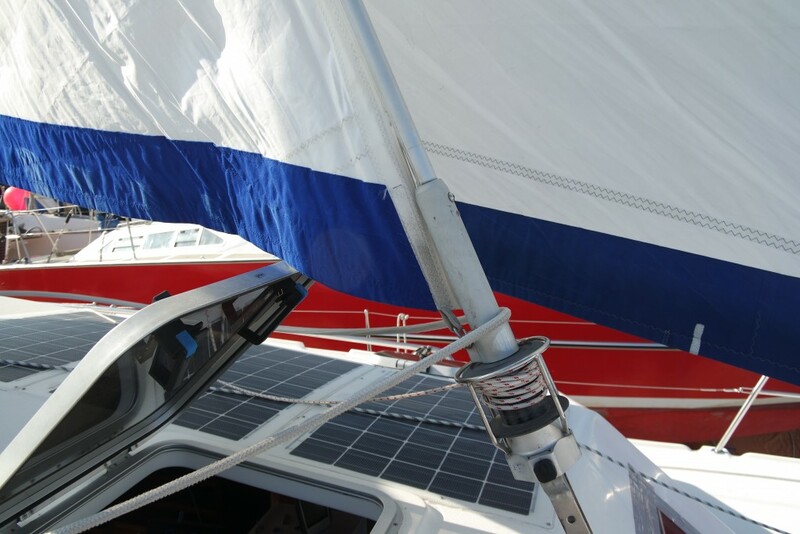 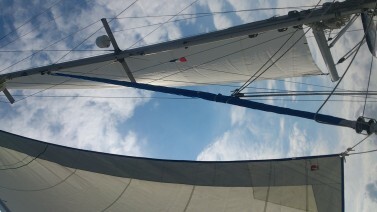 All Sails by Jeckels: Z-Spar in-mast Main Sail (2005), Genoa and Staysail on PROFURL roller furling. 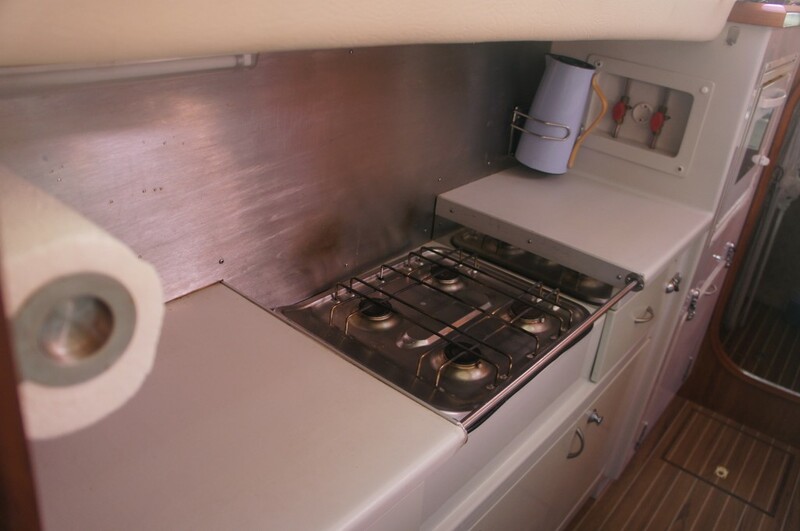 Blister as option available. 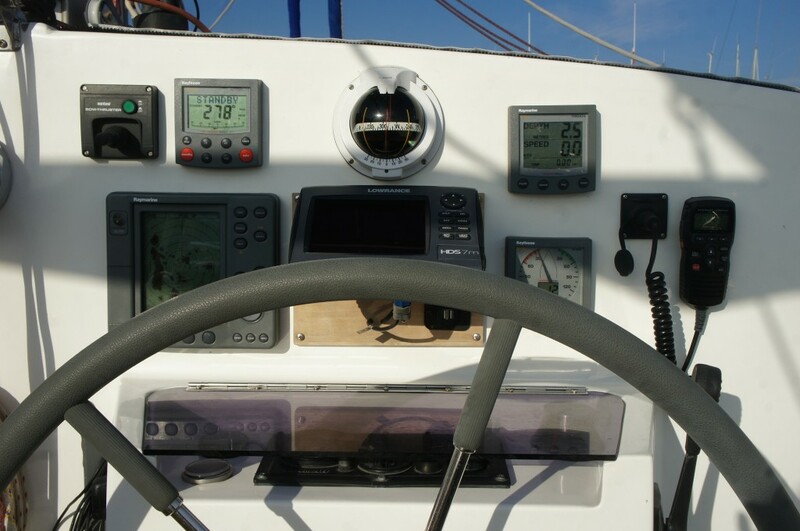 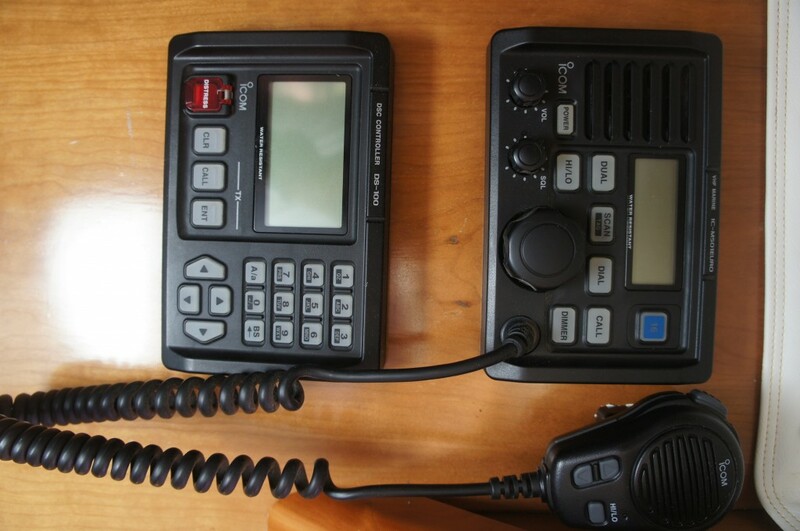 Saturn Compass, Raytheon ST60 Wind/Speed direction, ST60 Depth sounder, ST60 Autopilot, Raymarine Radar, Chartplotter Lowrance HDS 7m with Navionics Europe chart (Option), VHF ICOM IC 501 (DSC) or Standard Horizon (2015) with DSC and AIS as option. 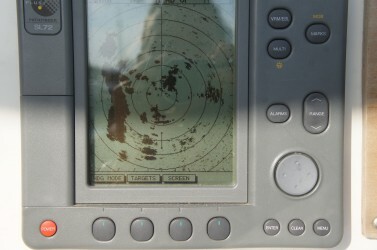 Lifering, Radar reflector. 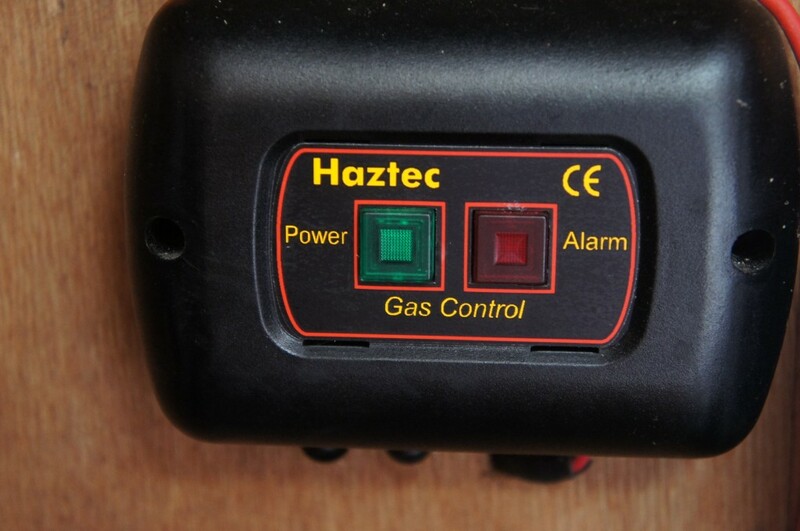 4 Bilge pumps (2 electric, 2 manual), 3 Fire extinguishers, Gas detector. 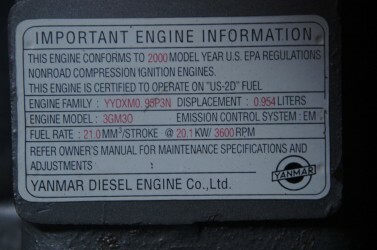 35lbs CQR.